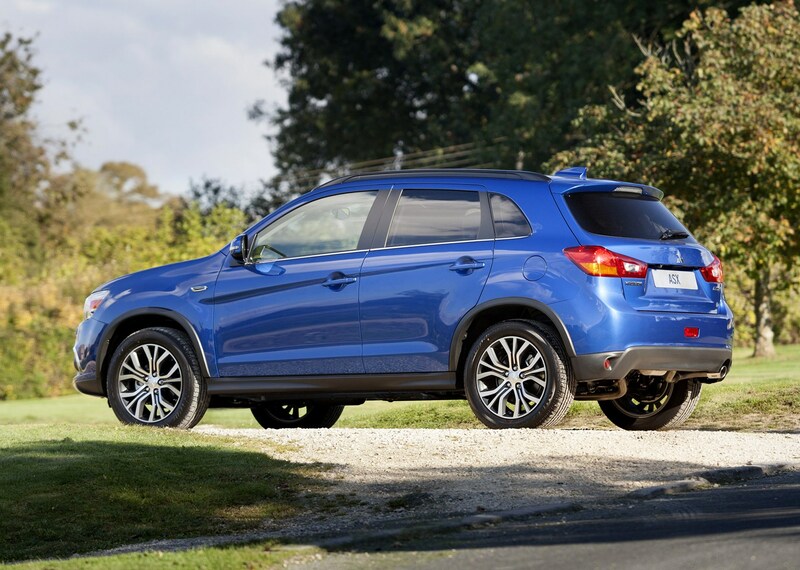 Competing in the mid-sized crossover market is the Mitsubishi ASX SUV, designed to appeal to family car buyers who want something a little different from the standard family hatchback. 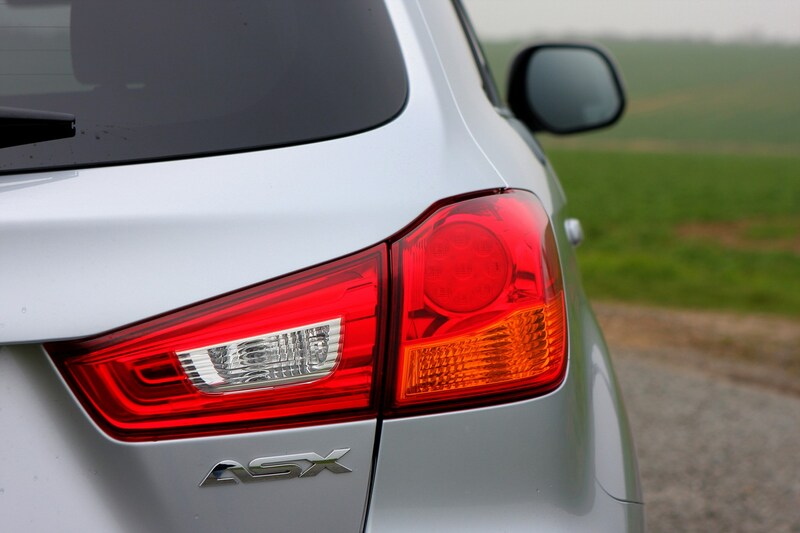 The ASX provides the driving experience of a typical hatch but with the benefits of an SUV such as high driving position and, where fitted, four-wheel drive. 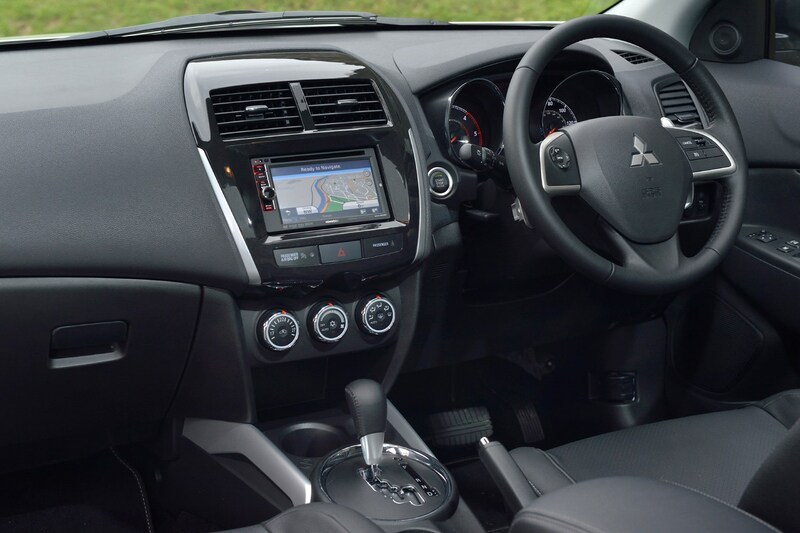 Even entry-level models come well-equipped, while the more expensive models come with lots of luxuries such as heated leather seats, panoramic sunroof and a touchscreen infotainment system with sat-nav. 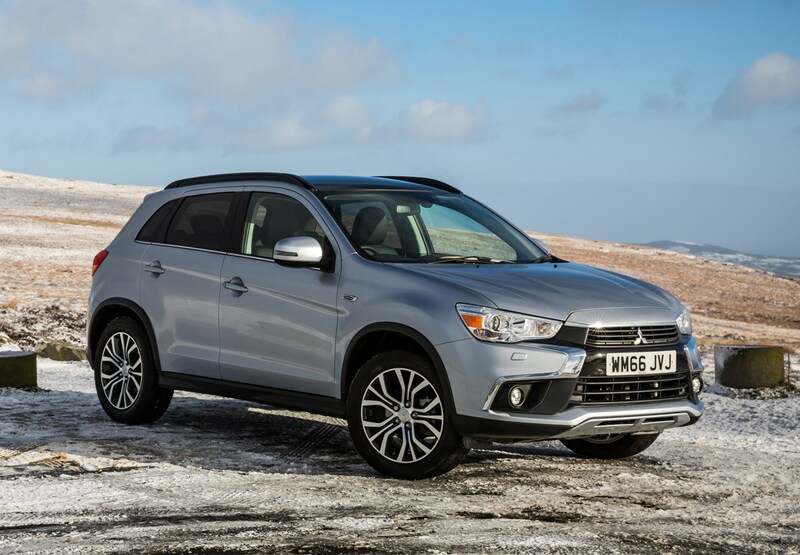 Aimed squarely at the Nissan Qashqai’s heartland, the Mitsubishi has a tough job on its hands, not just competing against direct rivals such as the Suzuki SX4 S-Cross, but the free glut of newcomers such as the Peugeot 3008, Renault Kadjar and SEAT Ateca. 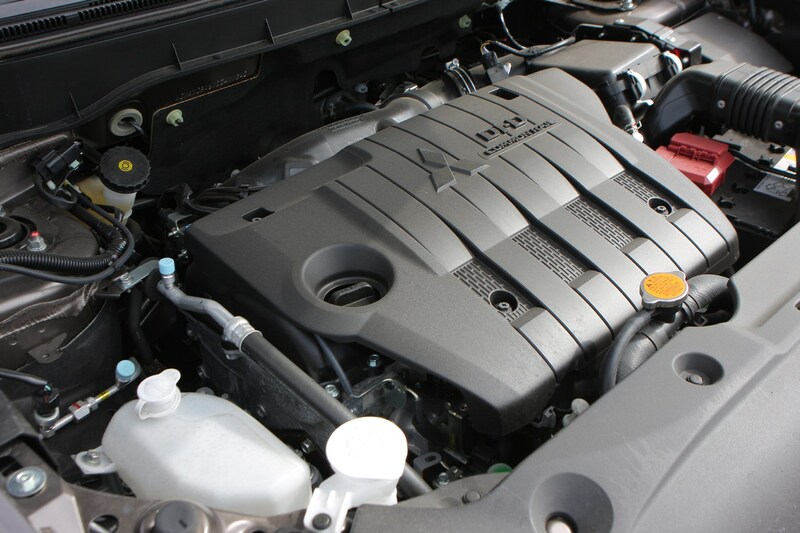 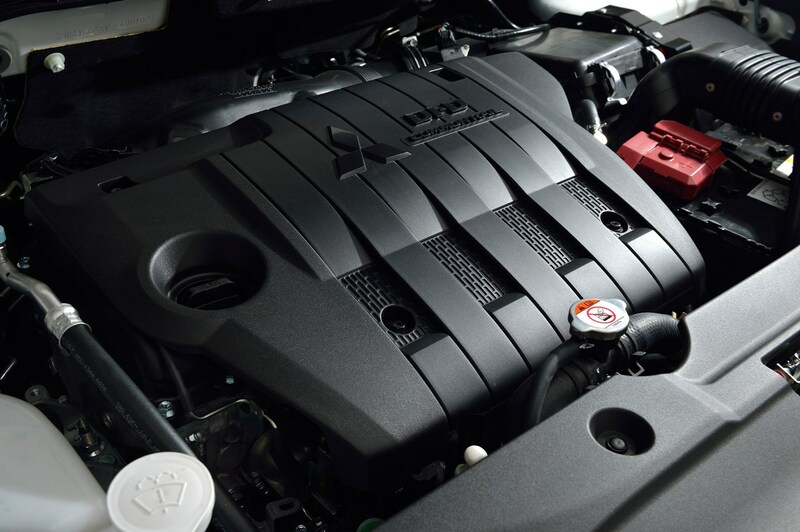 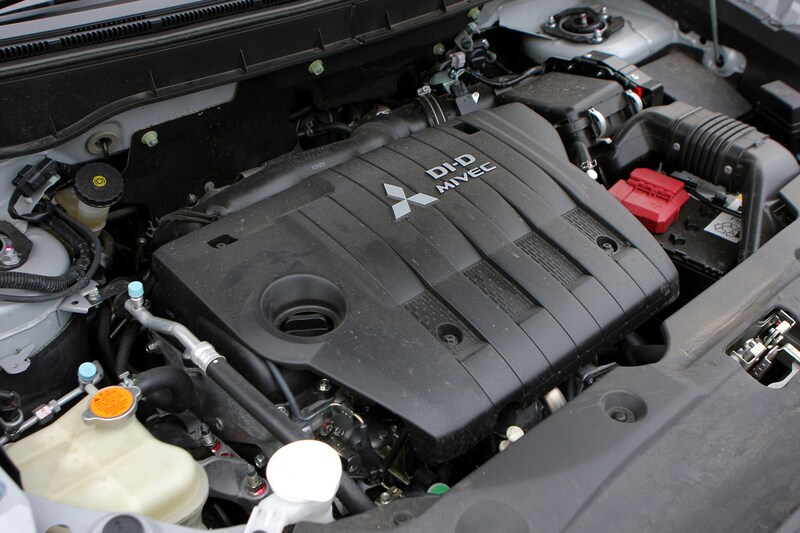 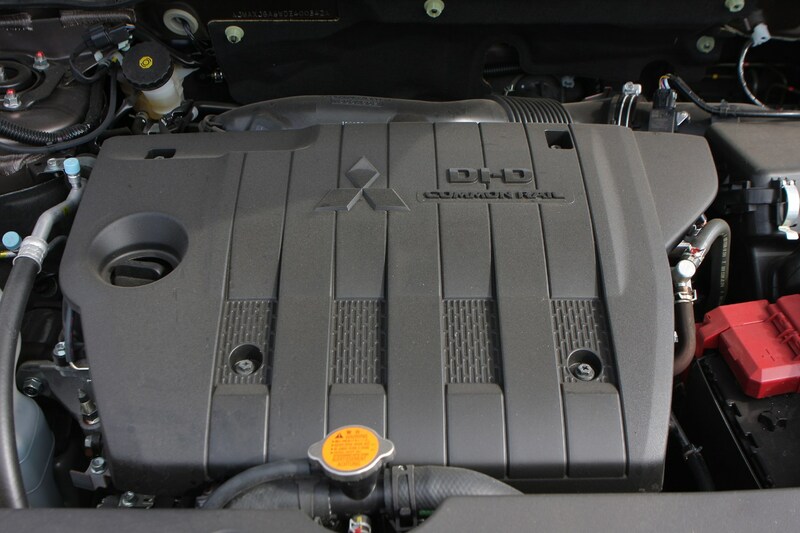 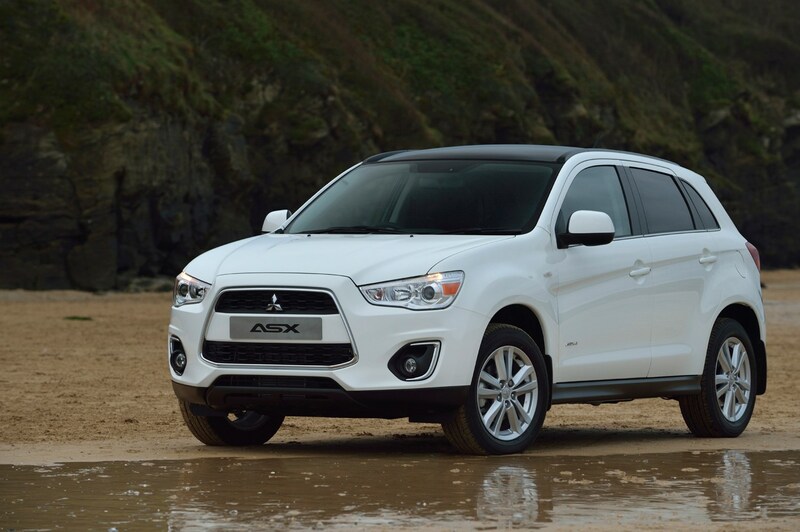 The 114hp 1.6-litre turbodiesel engine in the ASX is the one to go for if you want the lowest running costs. 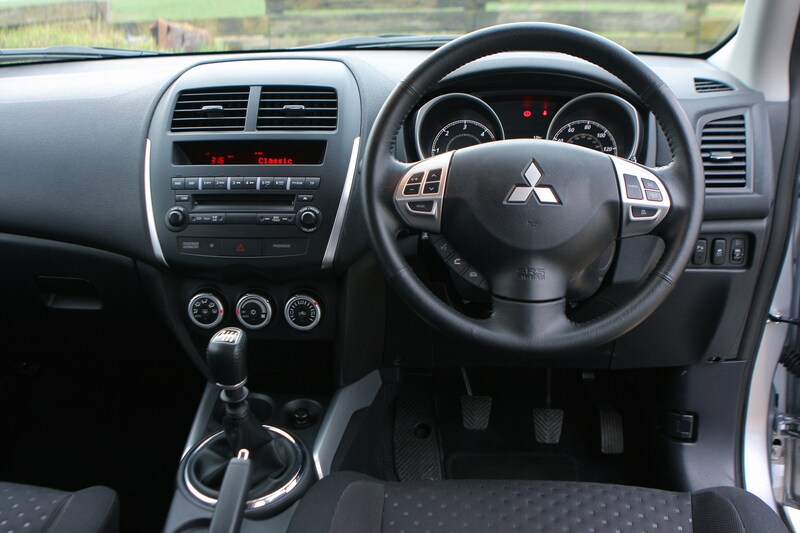 There’s 270Nm of torque available at low revs which makes it very useful for overtaking manoeuvres, however it’ll still sit happily in sixth gear on the motorway. 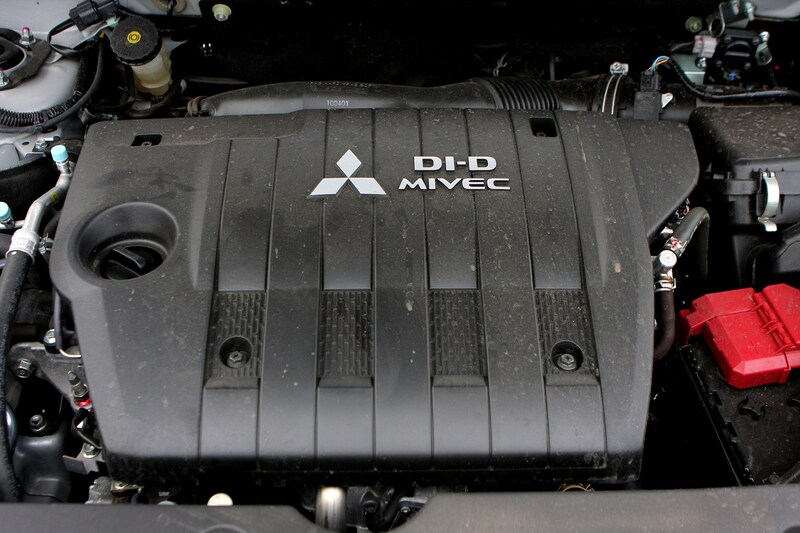 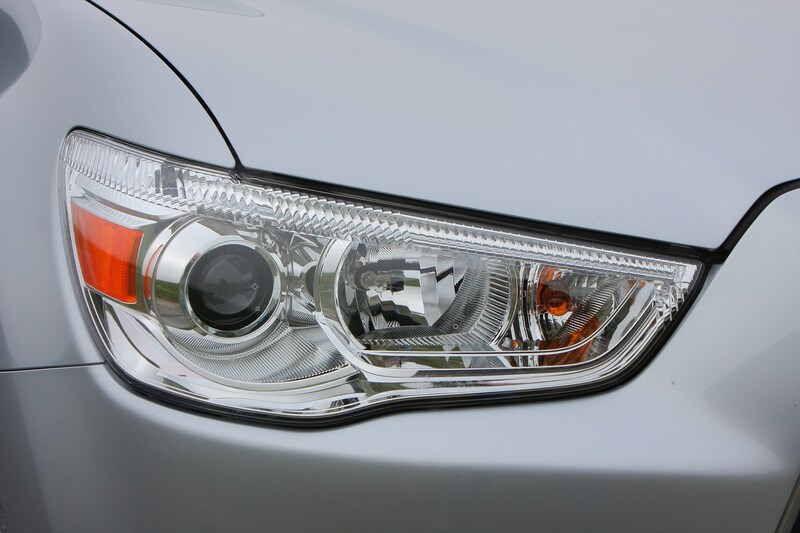 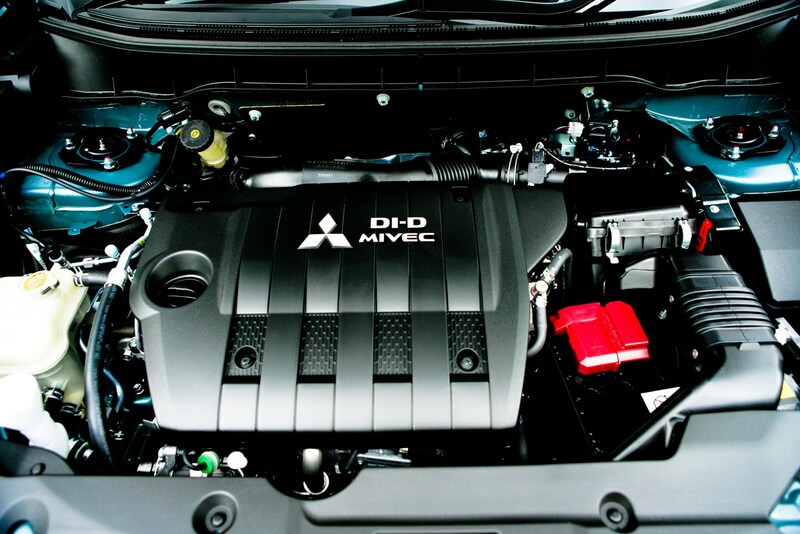 For more get-up-and-go, the 2.2-litre diesel produces 149hp and 360Nm of torque. 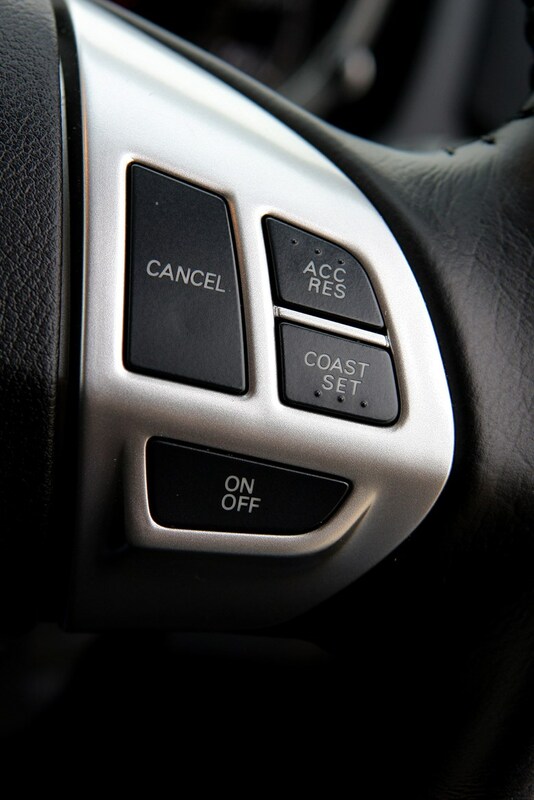 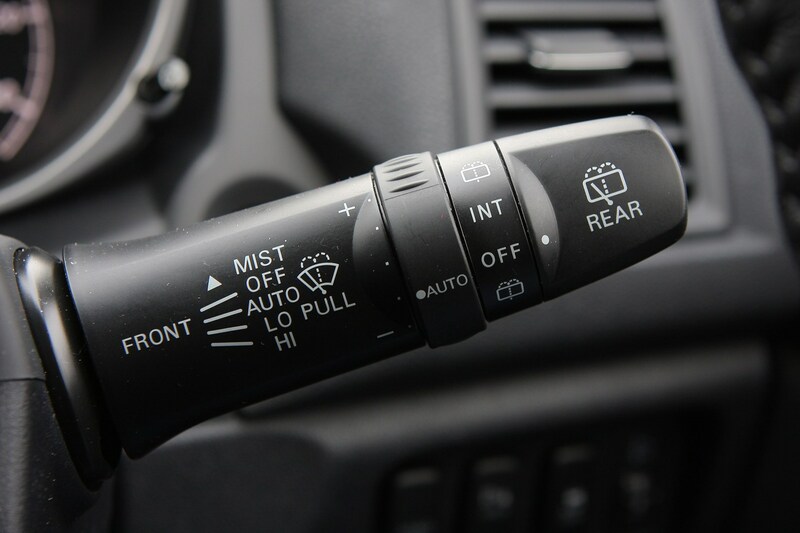 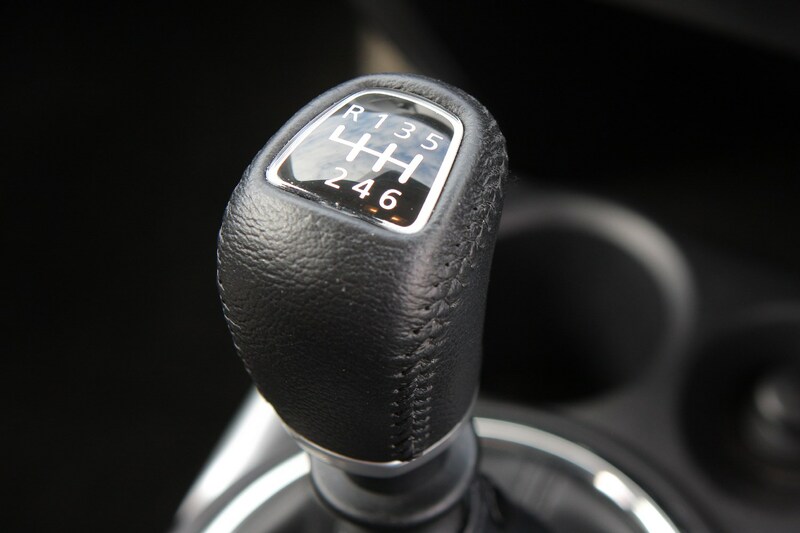 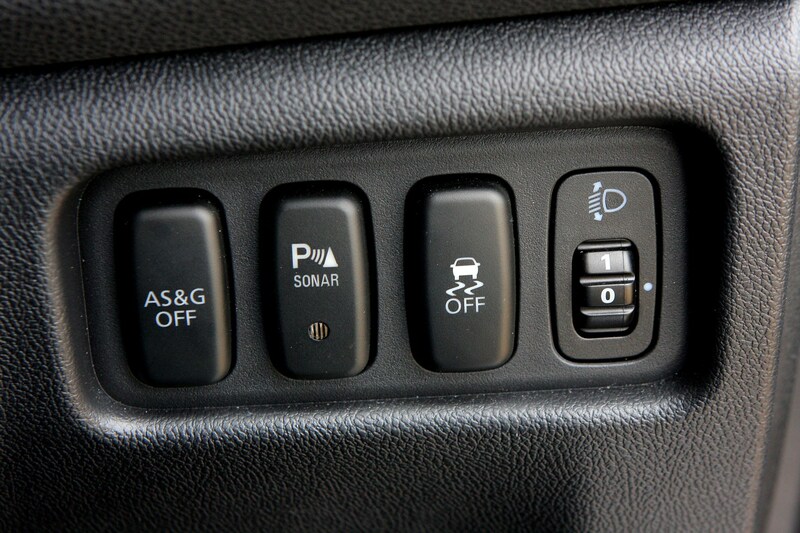 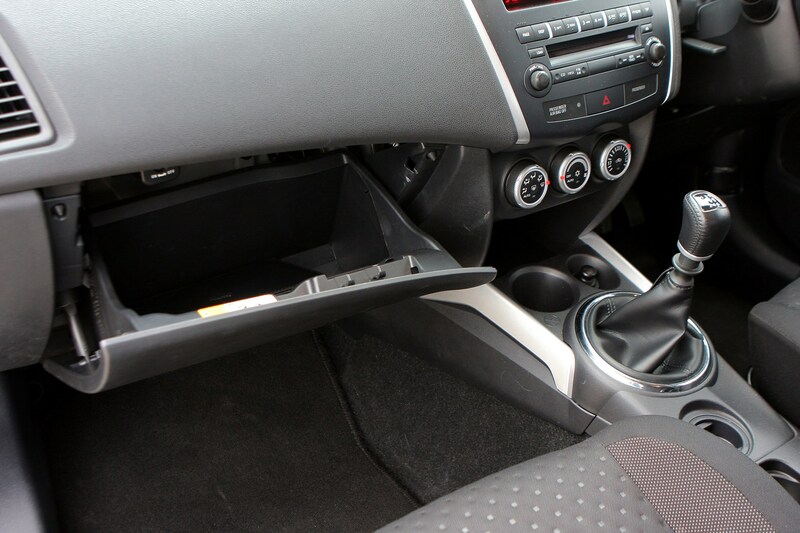 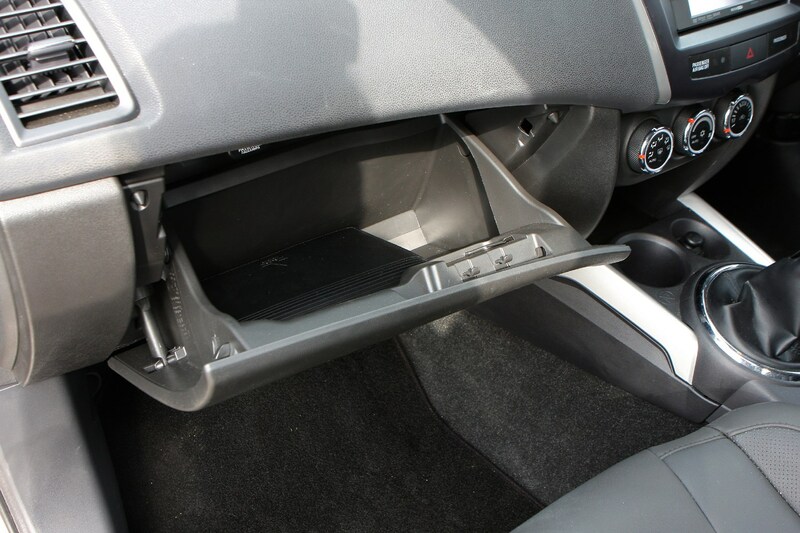 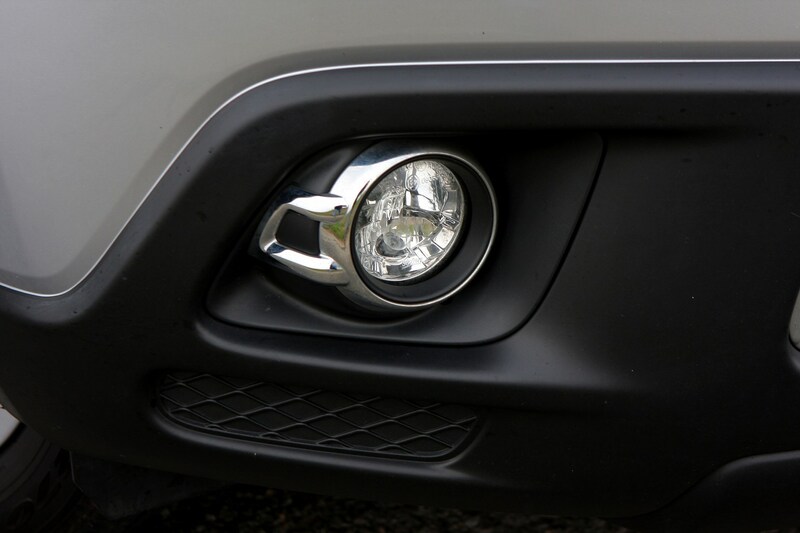 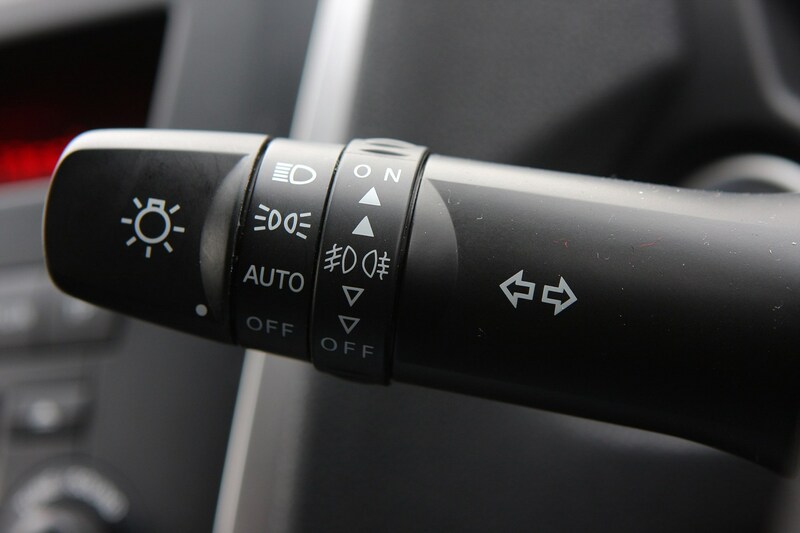 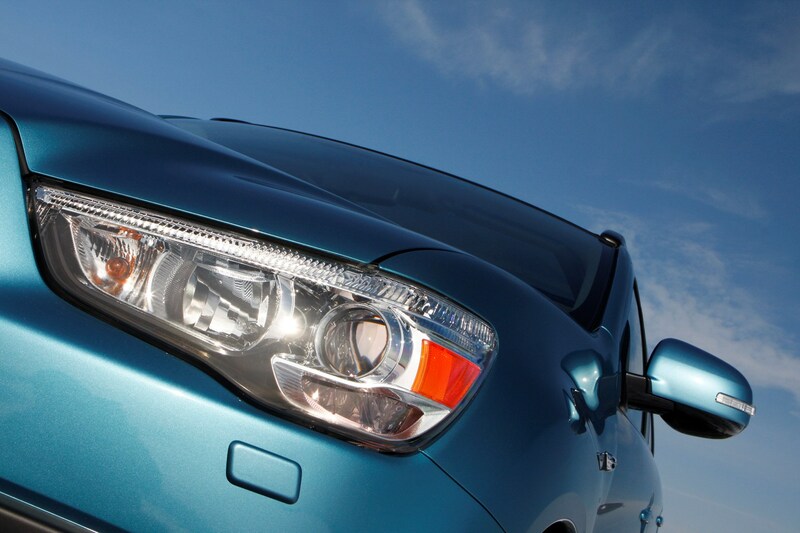 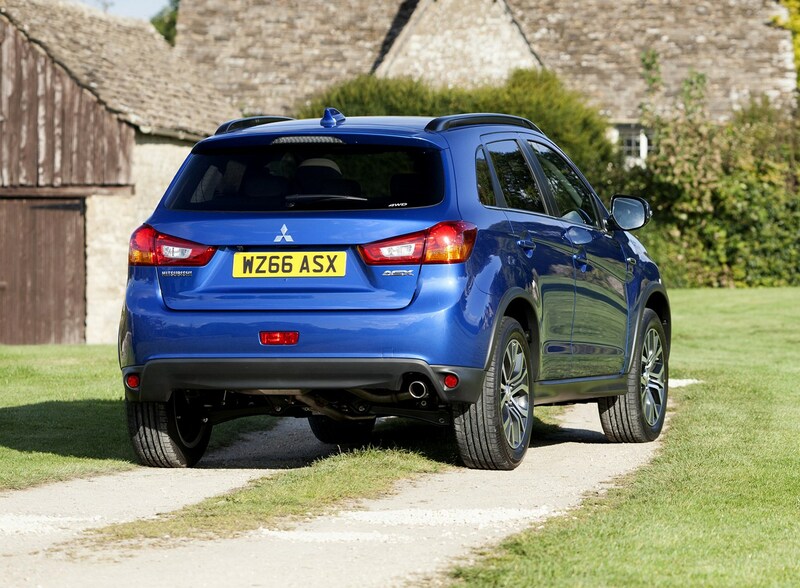 This is only available with an automatic transmission – this is the one to go for if you tow anything regularly. 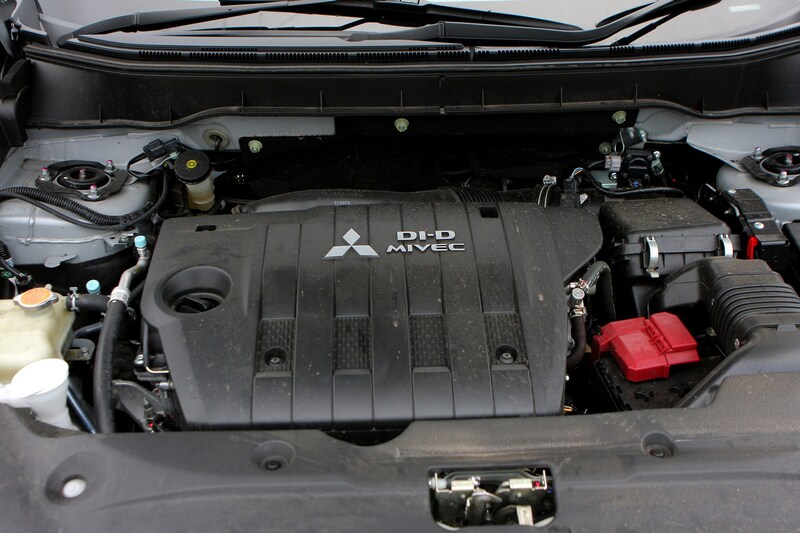 Four-wheel drive is available on both diesels, while the sole petrol engine – a rather dated and gutless 1.6-litre unit is only available in front-wheel drive form with a manual gearbox. 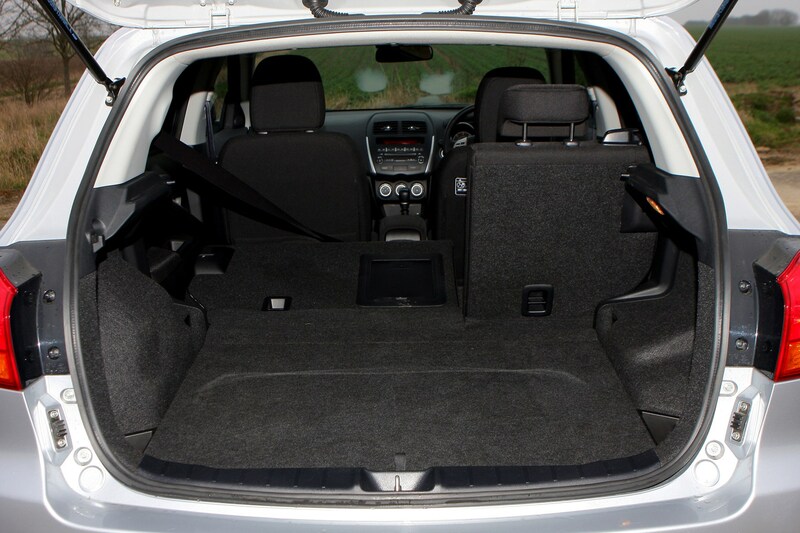 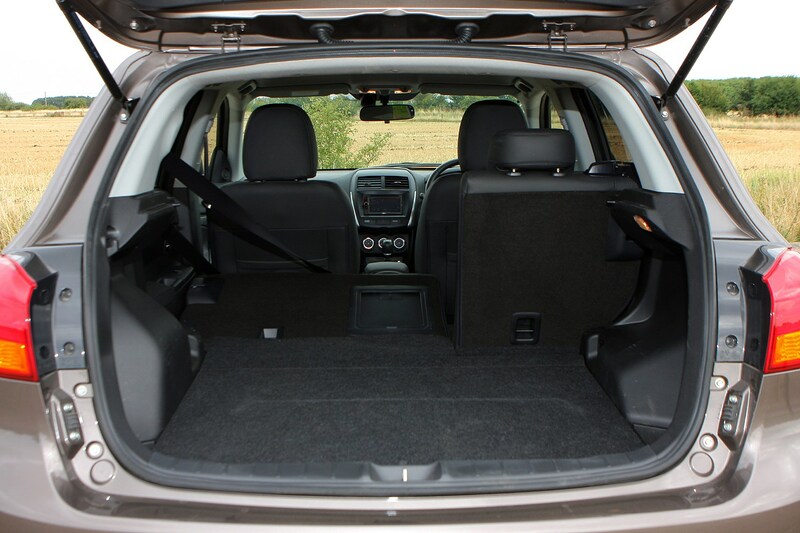 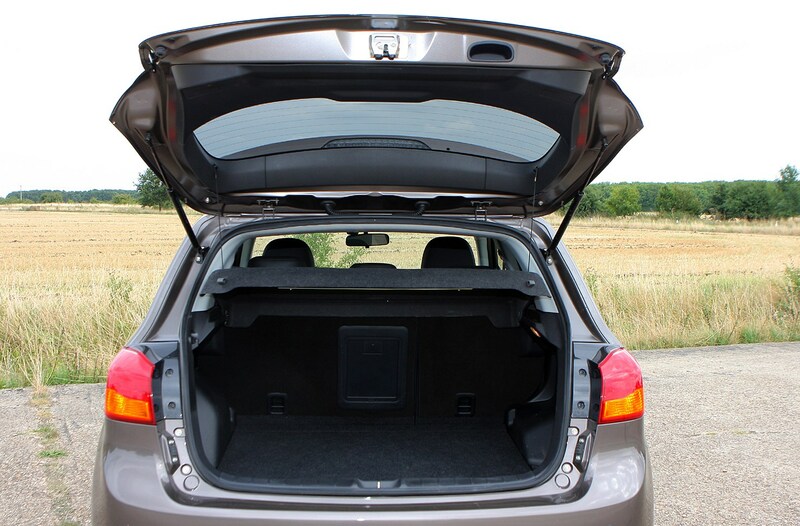 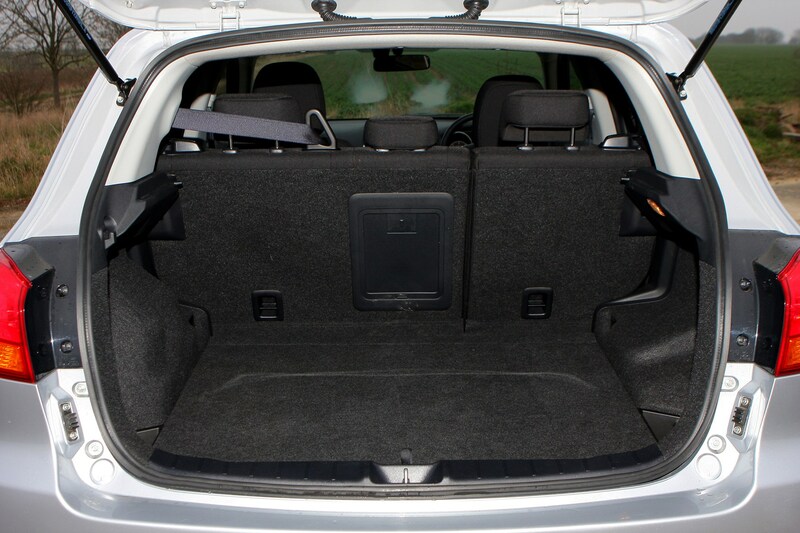 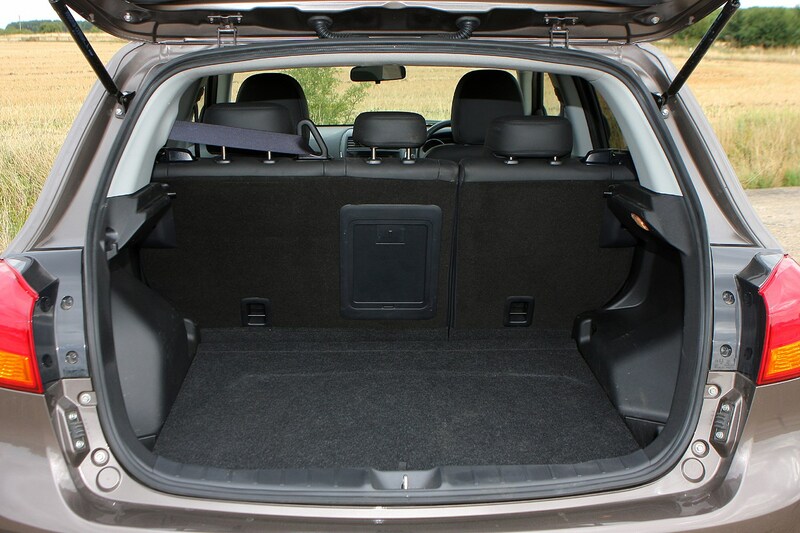 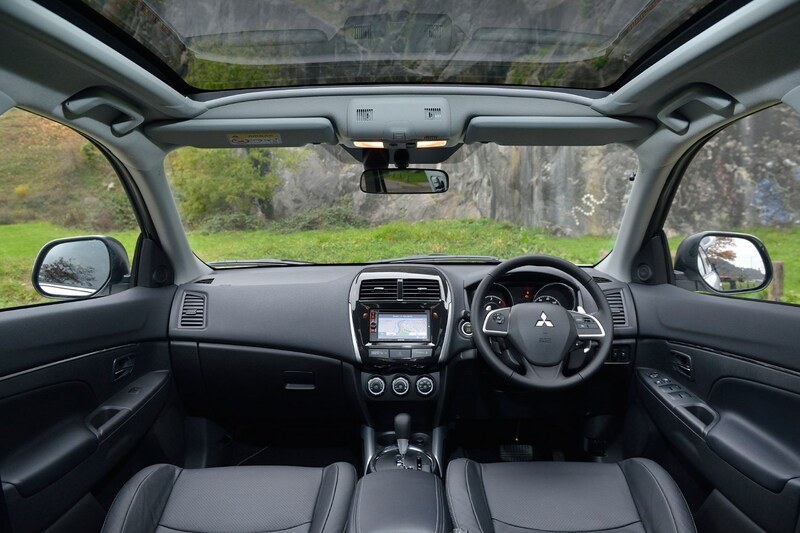 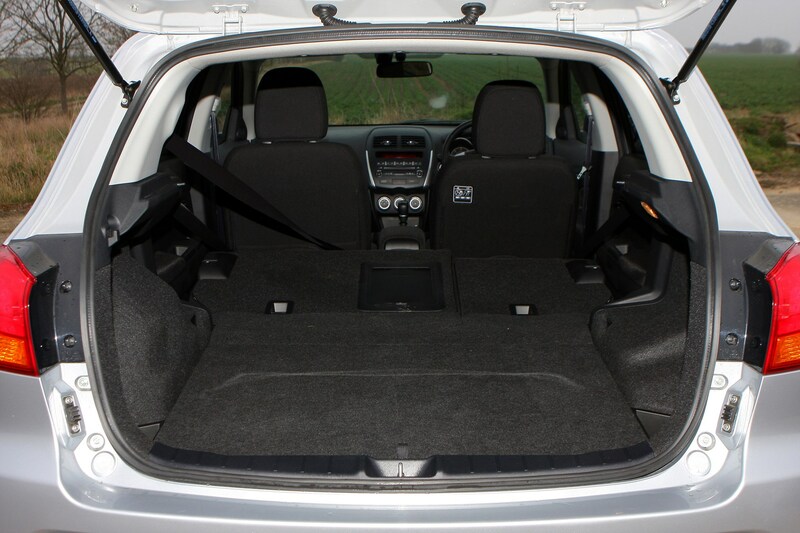 There’s no doubt in our minds the Mitsubishi ASX’s cabin is every bit as well made and solidly durable as the firm’s other SUVs. 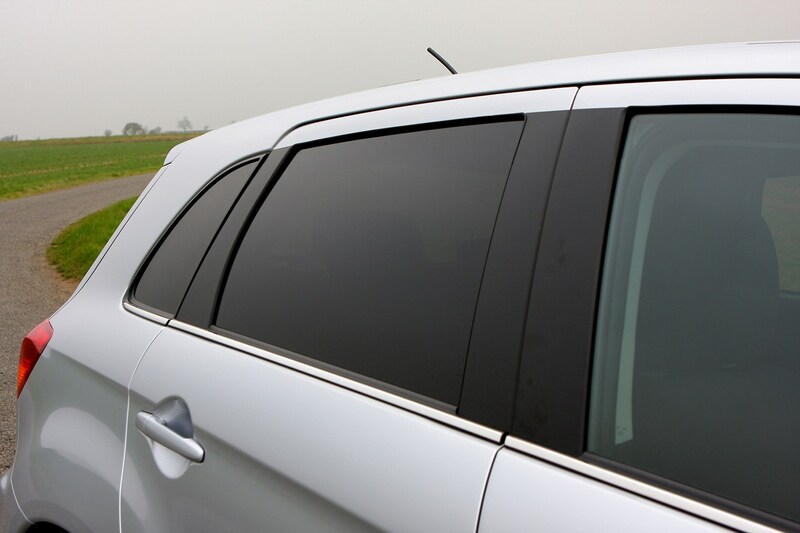 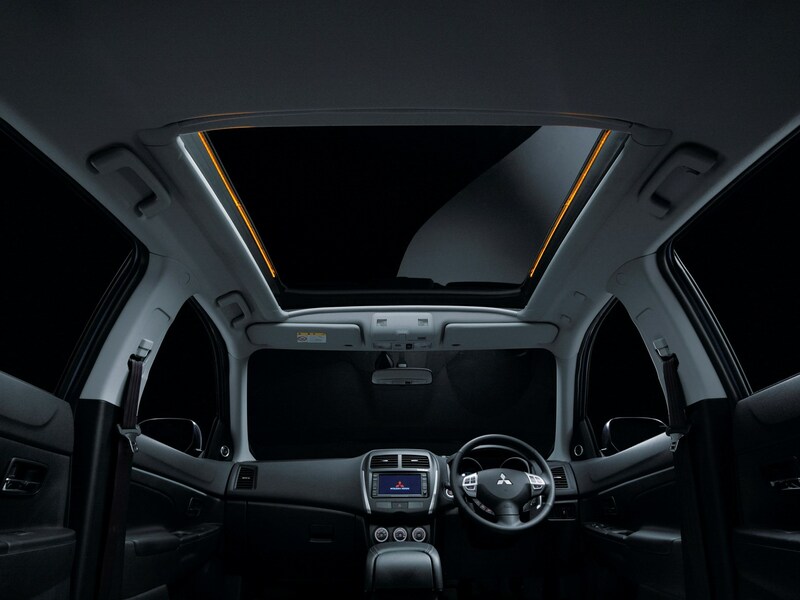 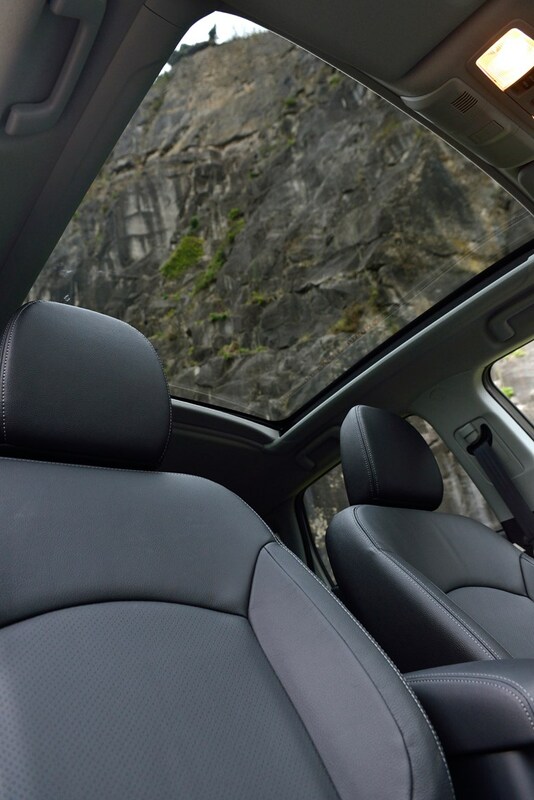 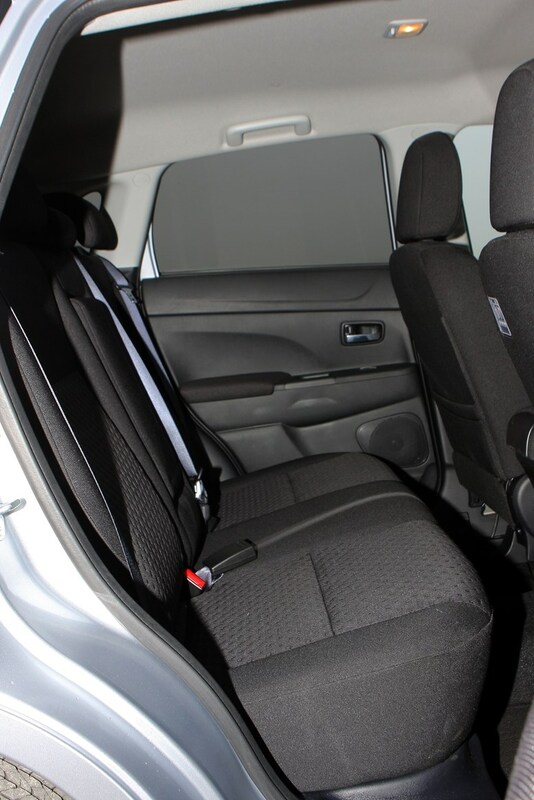 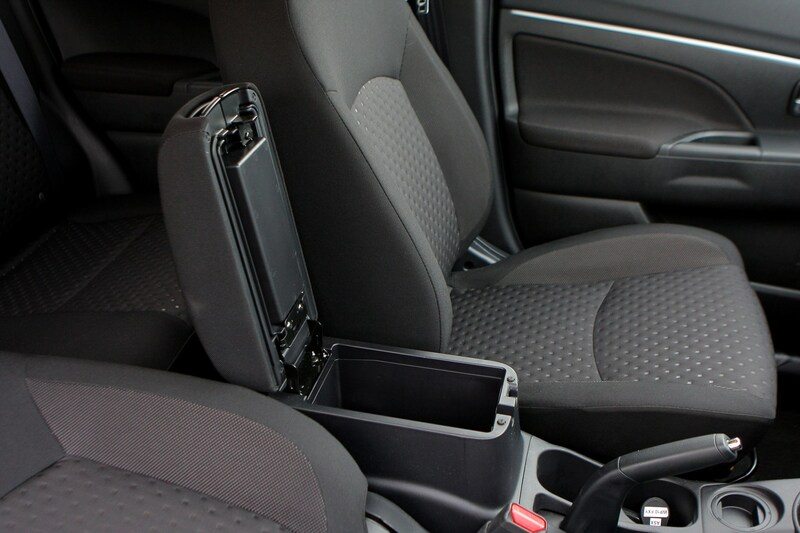 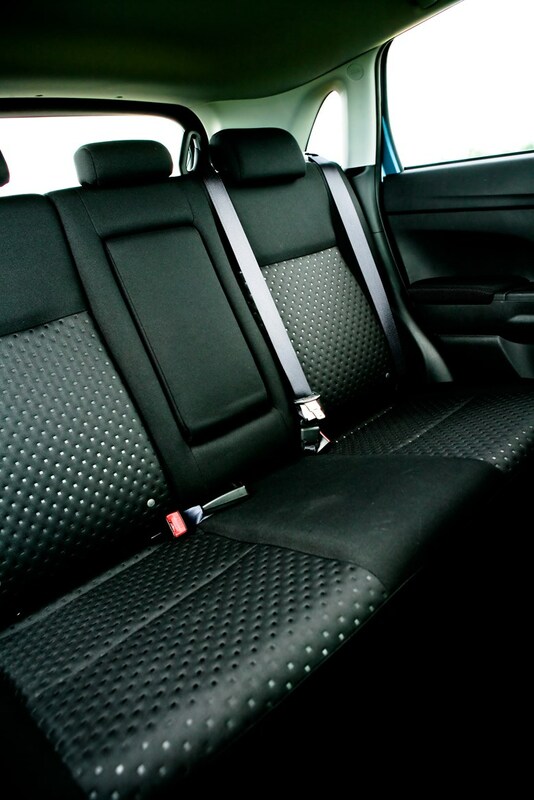 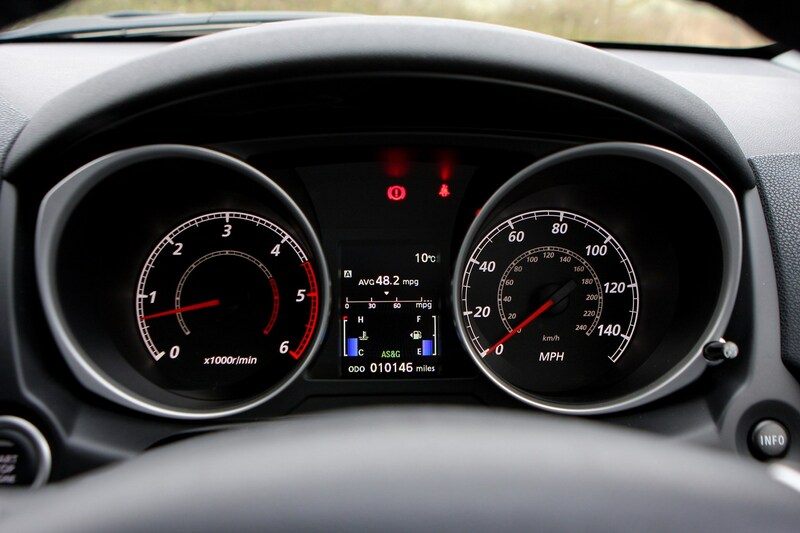 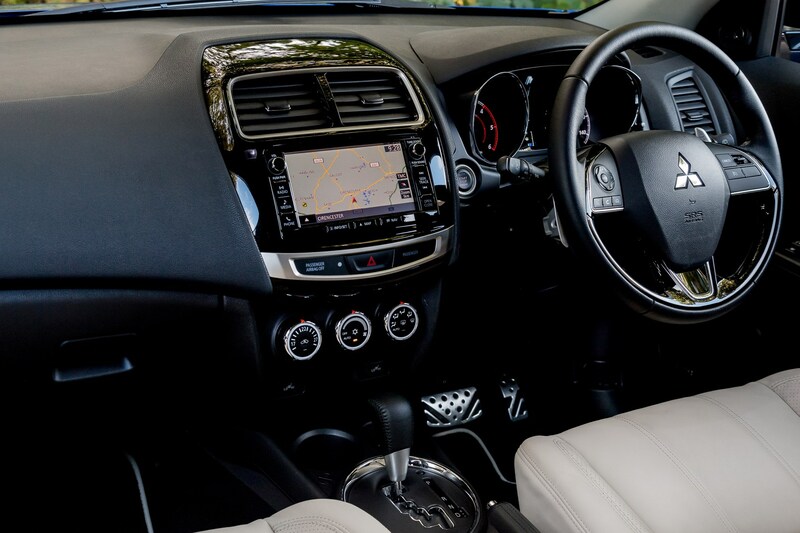 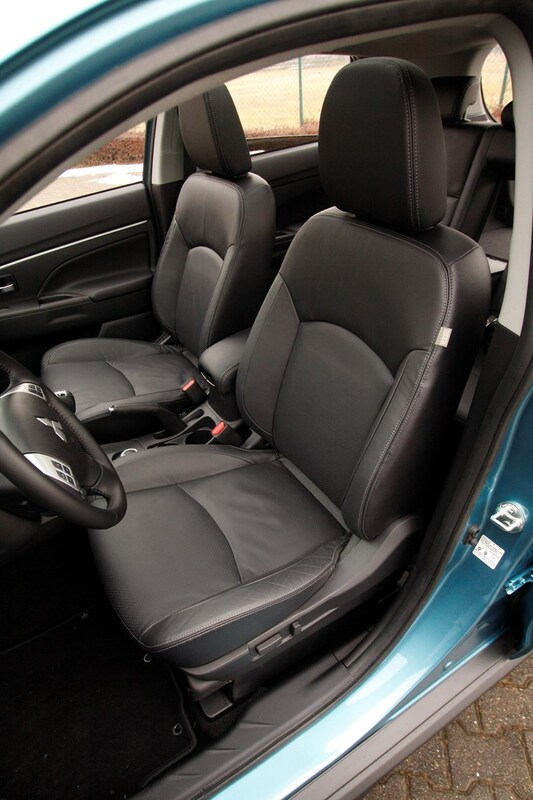 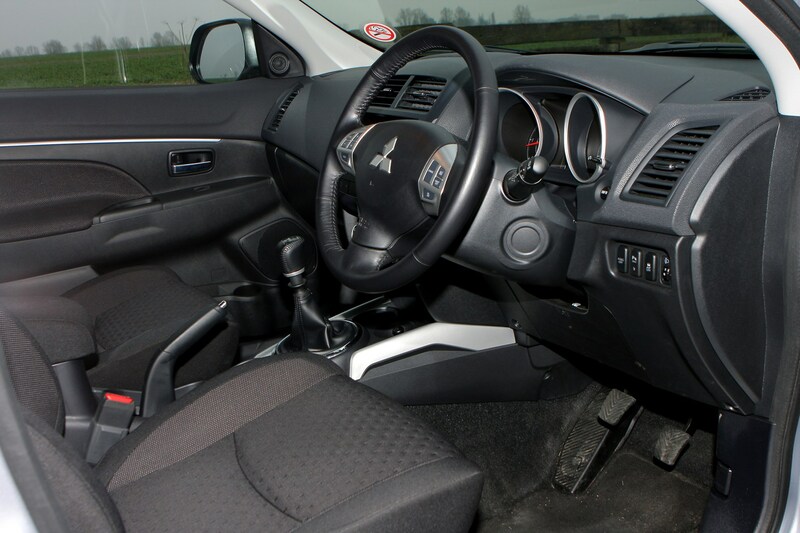 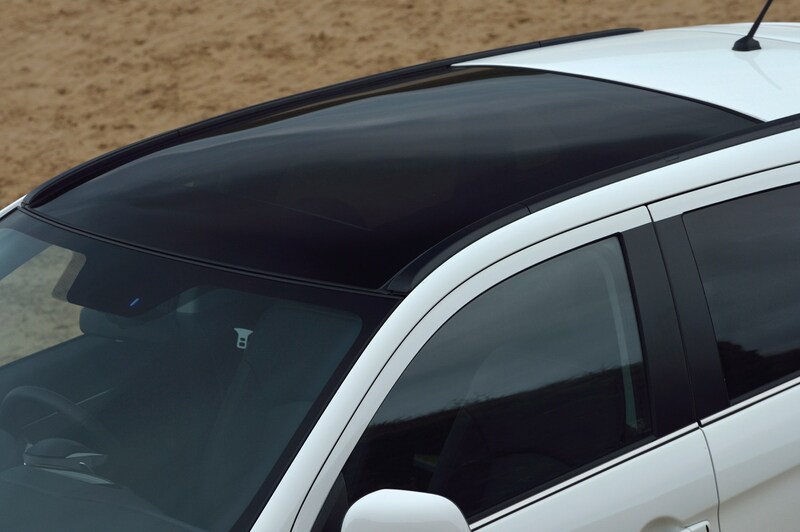 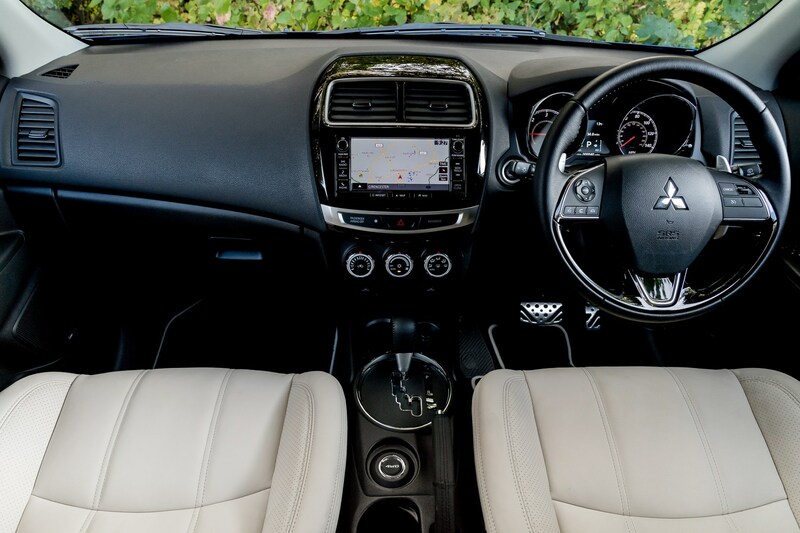 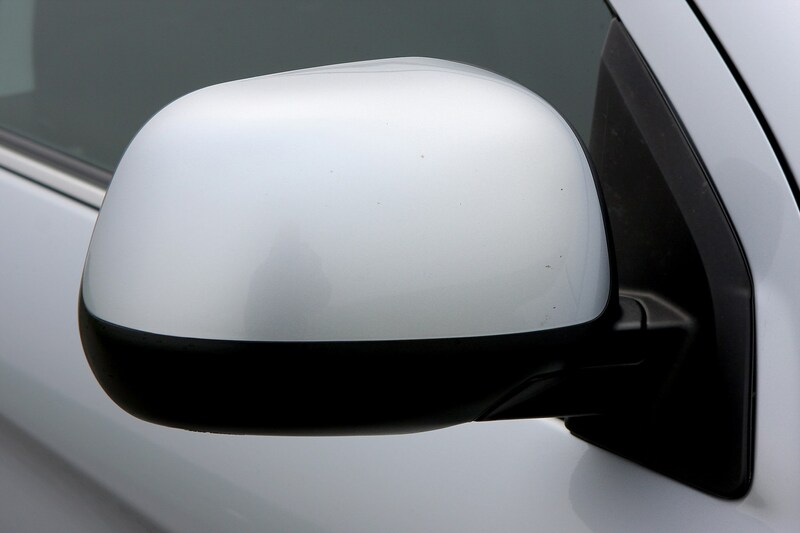 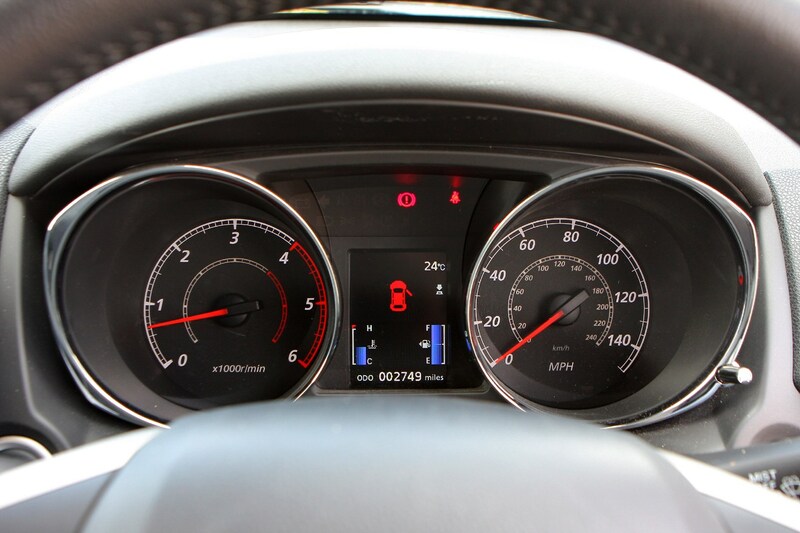 However, the ASX’s interior is little drab due to the extensive use of black or dark coloured materials that makes it all a bit too funereal compared to some of the ASX’s rivals. 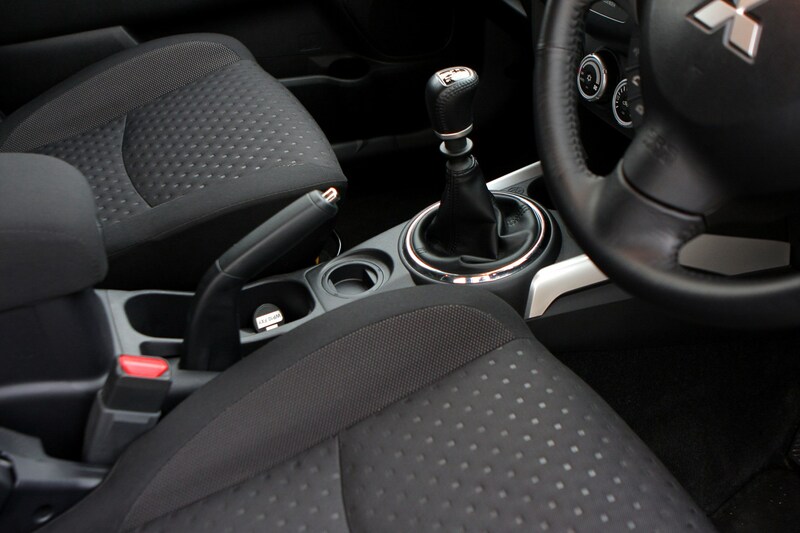 The mix of materials also don’t help here as they lend a uniformly dull look to the interior that leaves you feeling a little let down the designers didn’t try harder. 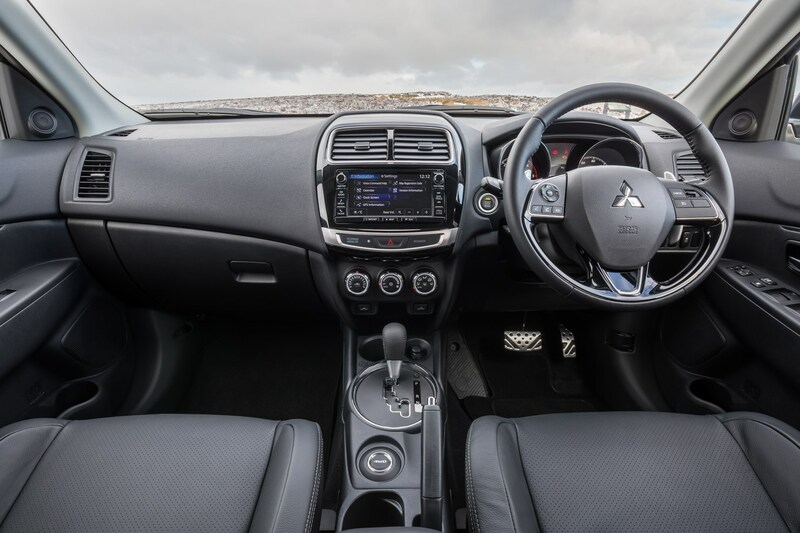 However, updates in 2016 and again in 2017 mean the cabin has been uplifted slightly with a few nicer-looking materials on the dashboard and some piano black trim around the infotainment system and air-con controls, but it’s still some way behind newer, plusher rivals. 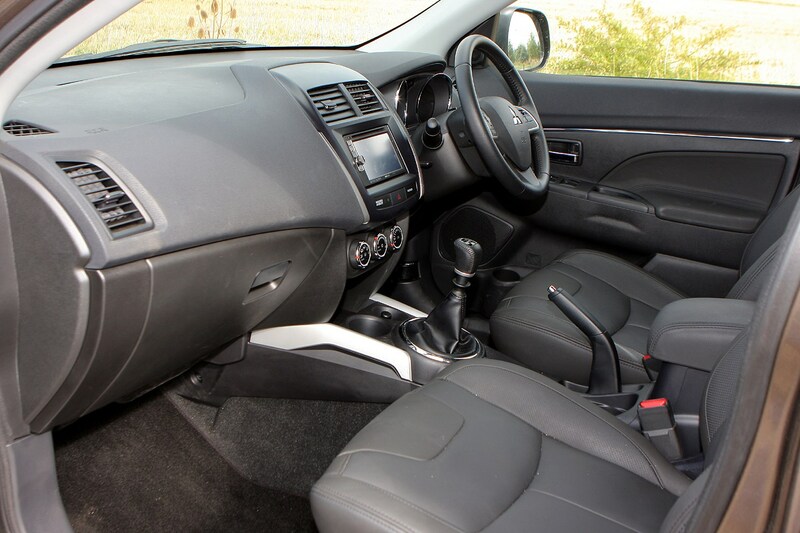 Still, comfort is good and the raised driving position imparts that all-important commanding SUV-style driving position. 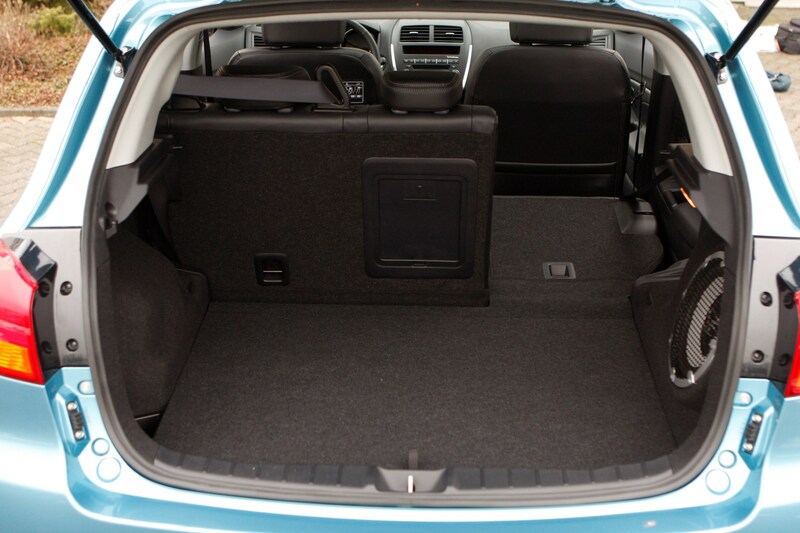 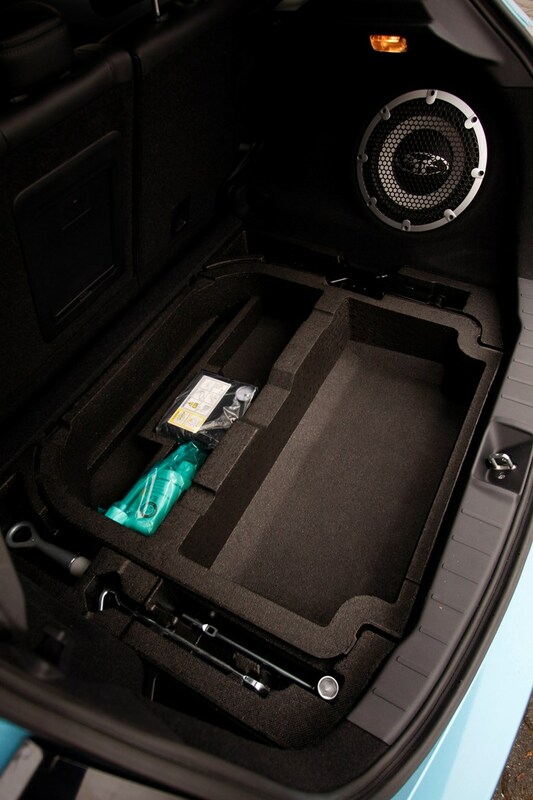 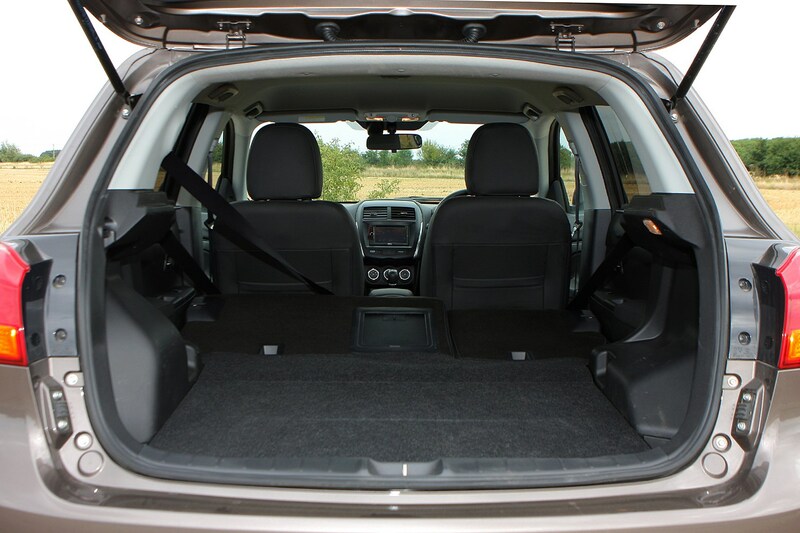 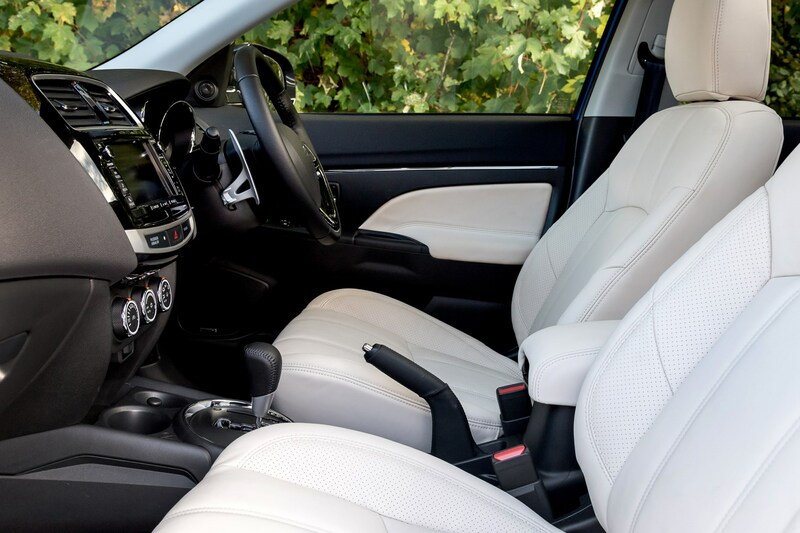 The seats are also very comfortable and supportive, which makes the ASX a good choice for anyone who notches up plenty of miles, while interior space is impressive for with a relatively small footprint such as this. 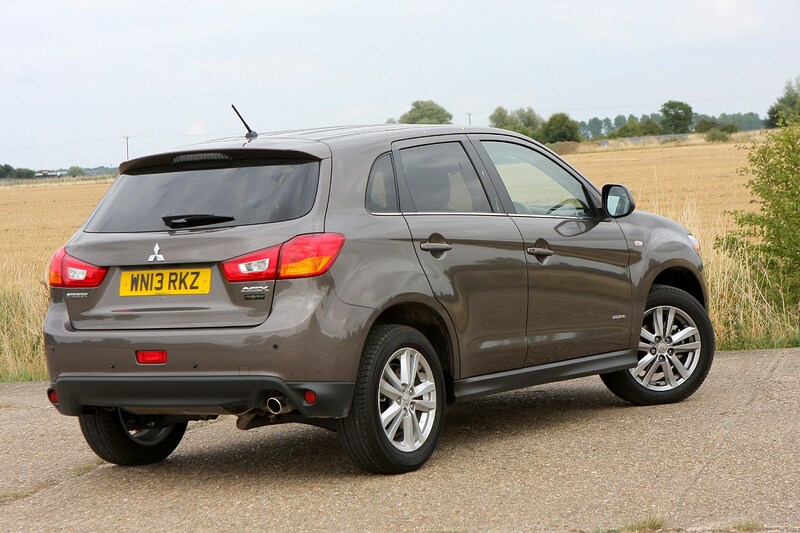 July 2010 – Launched in the UK with a choice of a 1.6-litre and 1.8-litre DI-D diesel engine, with four-wheel drive optionally available on the latter. 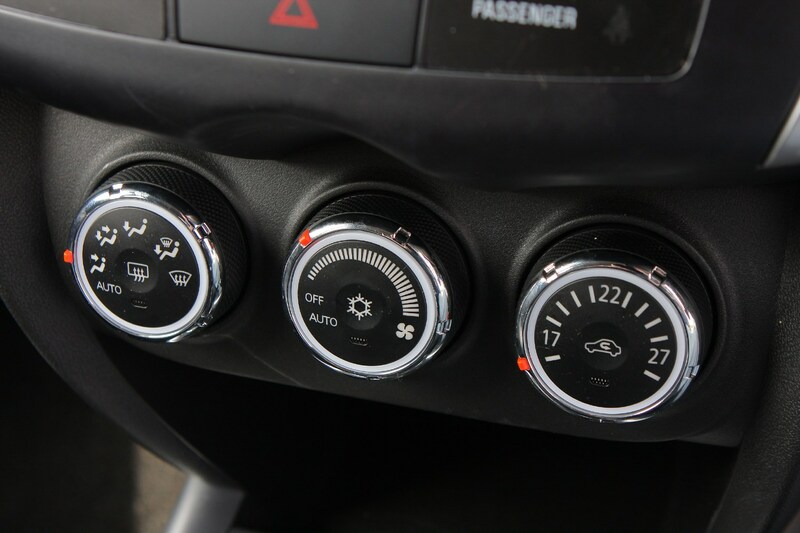 The range structure follows a simple numeric 2, 3 and 4 numeric system. 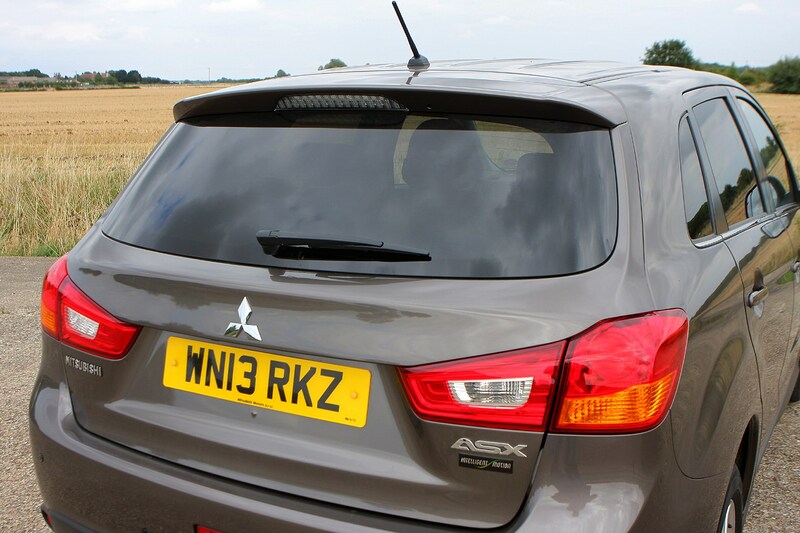 November 2011 – Limited edition ASX Black is based on the 4 specification, but is hallmarked with its black 17-inch alloy wheels, with matching roof, spoiler, door mirror caps, grille and foglamp surrounds. 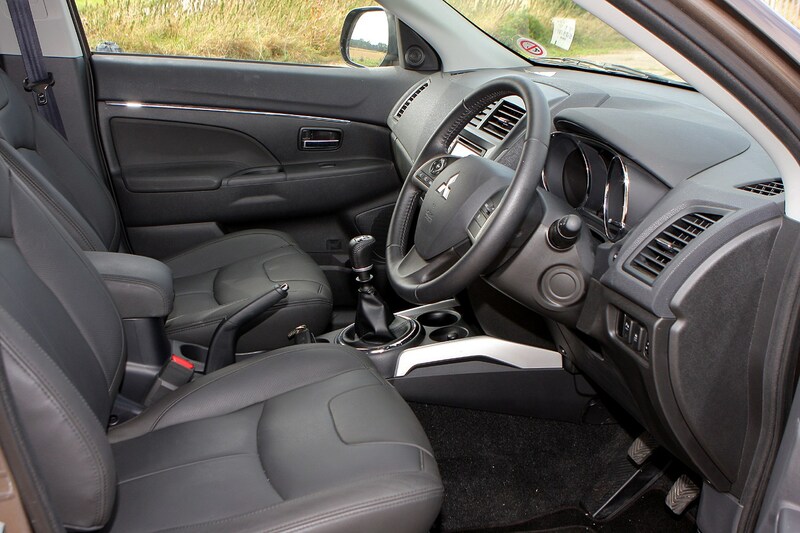 Inside there’s black leather upholstery and carbonfibre-look trim. 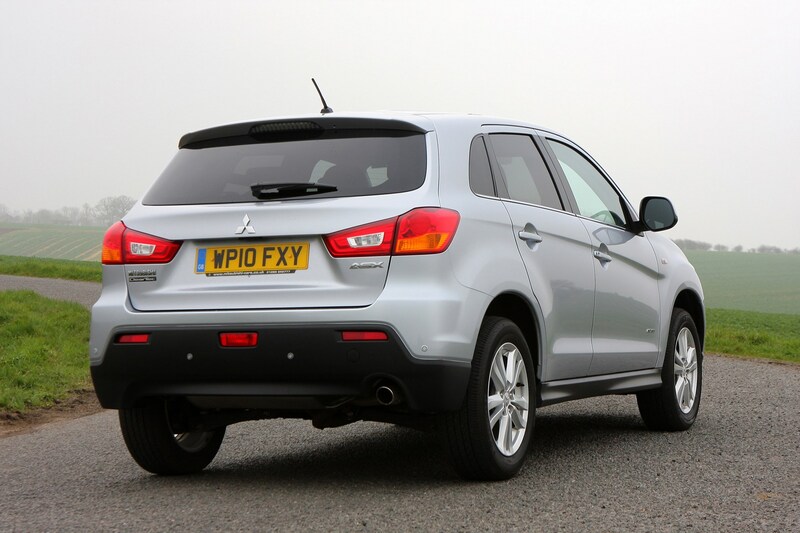 Both the 1.6-litre petrol and 1.8-litre DI-D diesel – the latter optionally with four-wheel drive – are available. 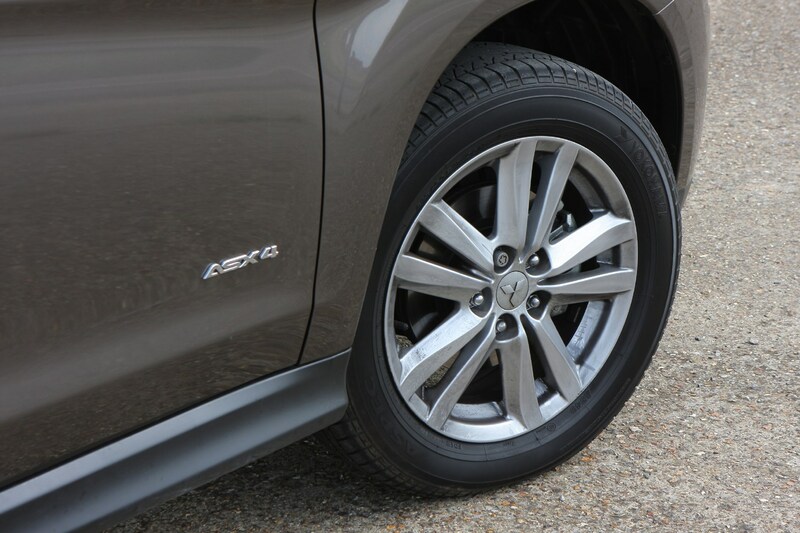 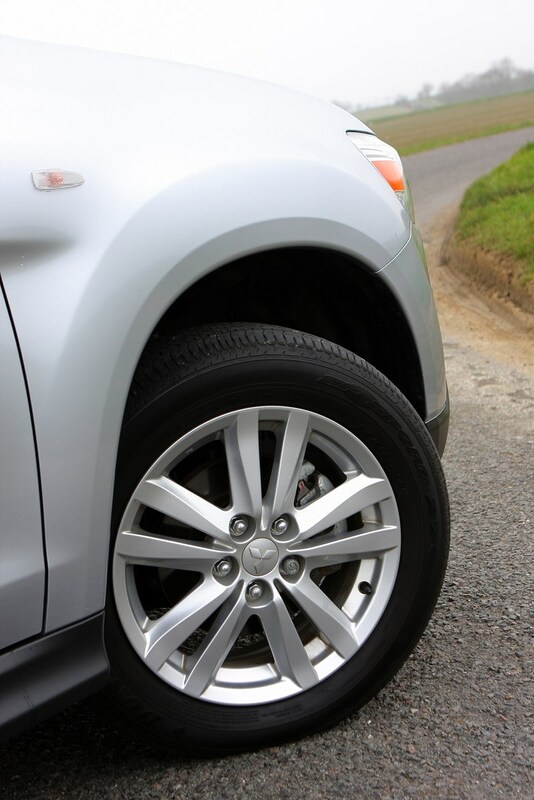 January 2012 – Minor changes for the year centre around the fitment of low-rolling resistance tyres and regenerative braking systems to boost efficiency. 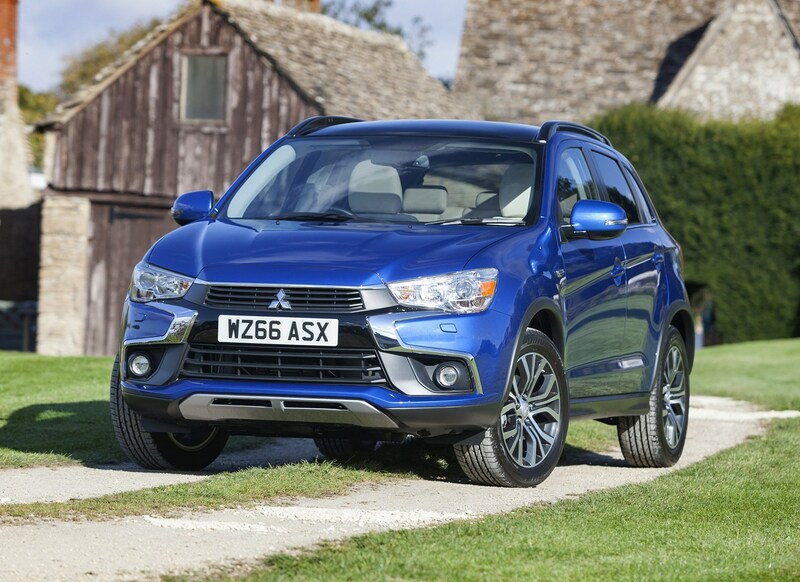 The 1.6 petrol improves from 47.1mpg to 47.9mpg with no change in CO2 emissions, while the 1.8 DI-D diesels rise from 51.0mpg to 54.3mpg, with emissions dropping to 136g/km of CO2 to 150g/km. 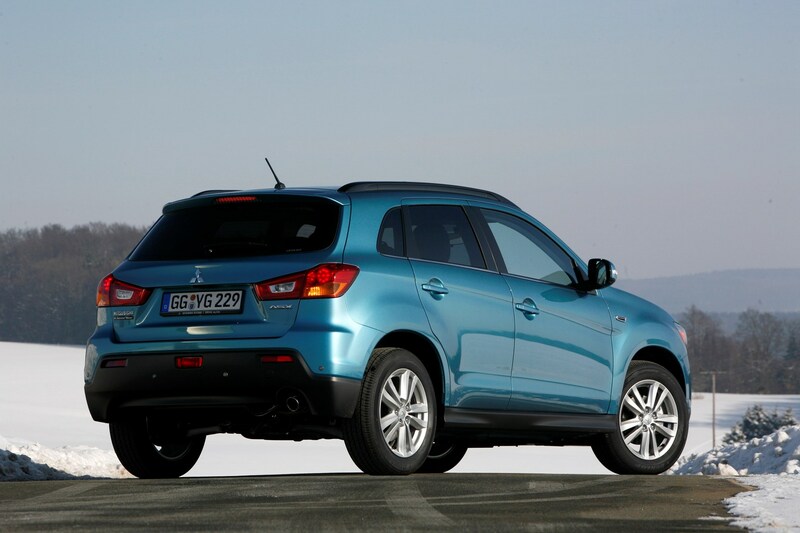 April 2012 – Special edition Attivo model launched, only with the 1.6-litre petrol engine. 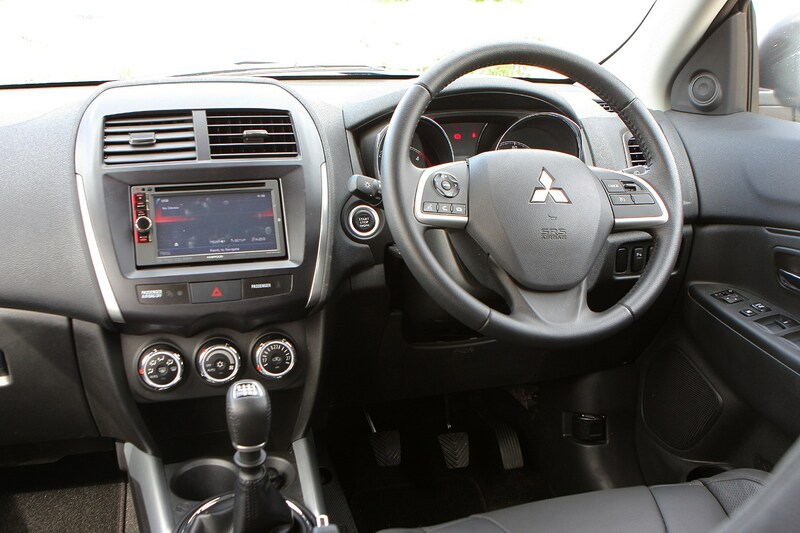 January 2013 – Styling modifications with a new grille and bumpers on the outside and fresh seat fabrics and chrome-look accents for the interior. 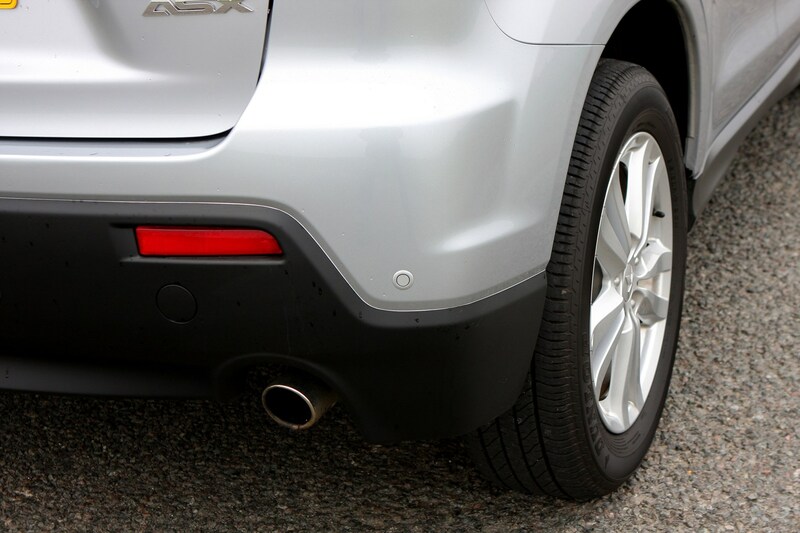 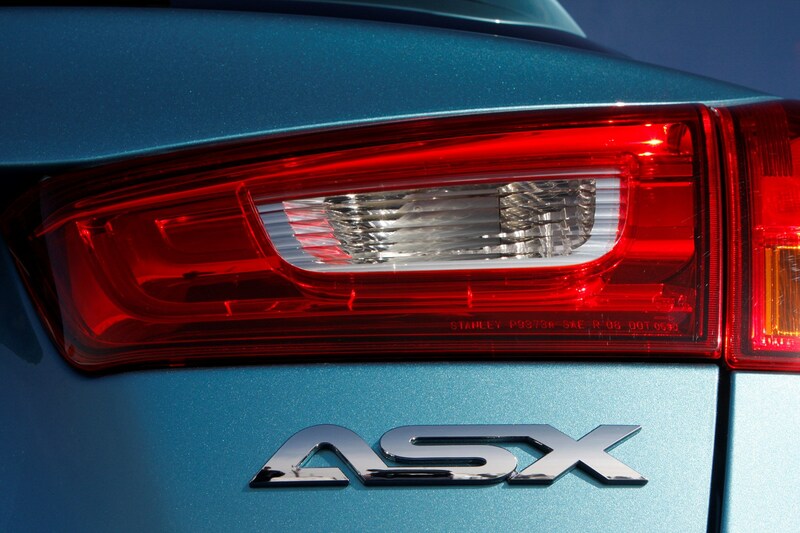 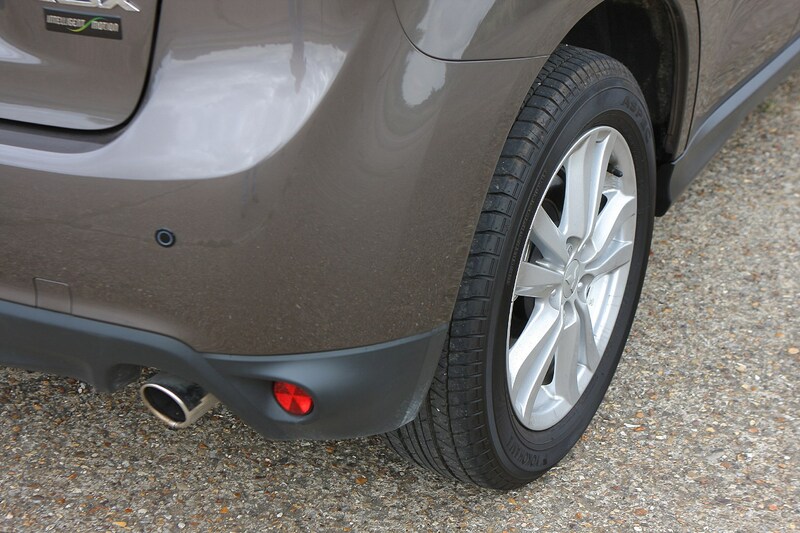 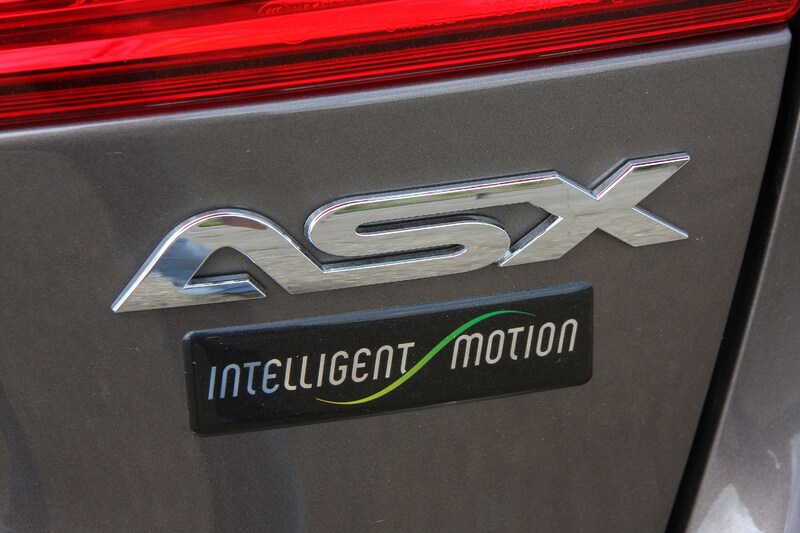 Revisions are also made to the independent rear suspension in a bid to improve the ASX’s handling characteristics. 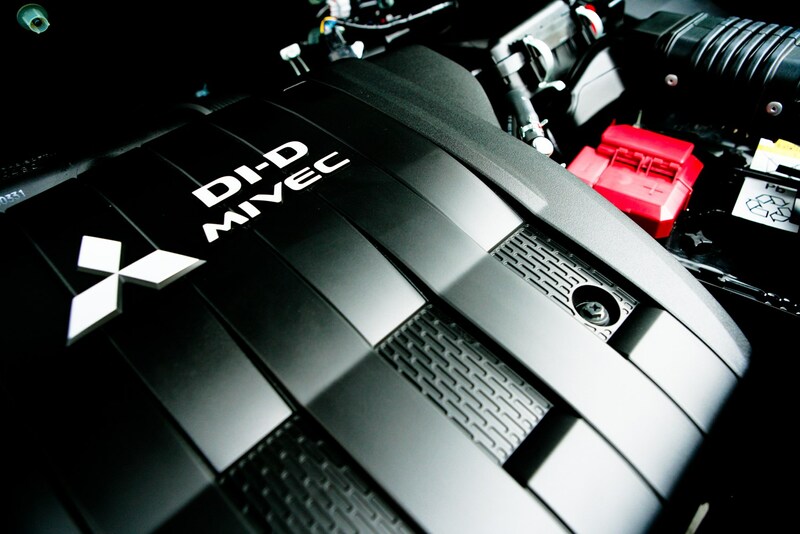 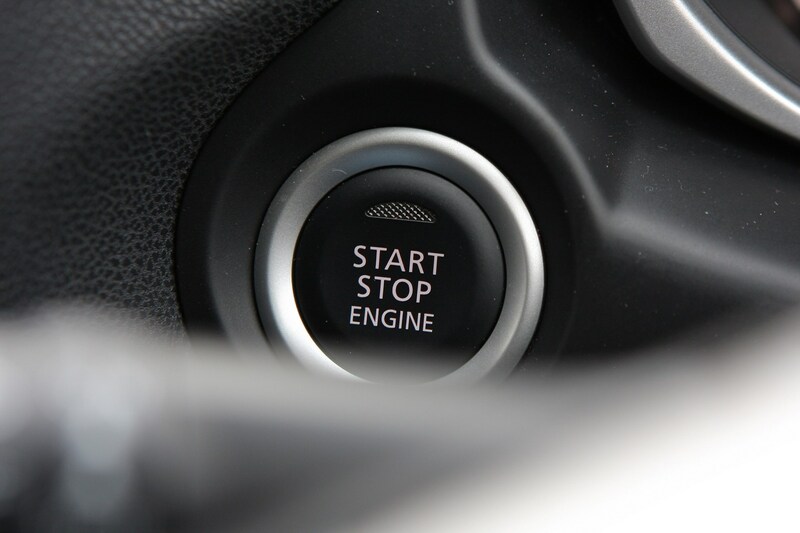 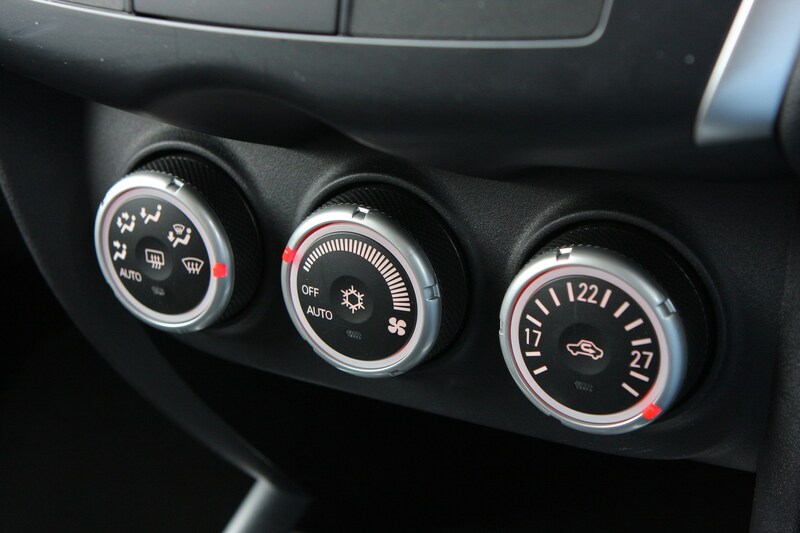 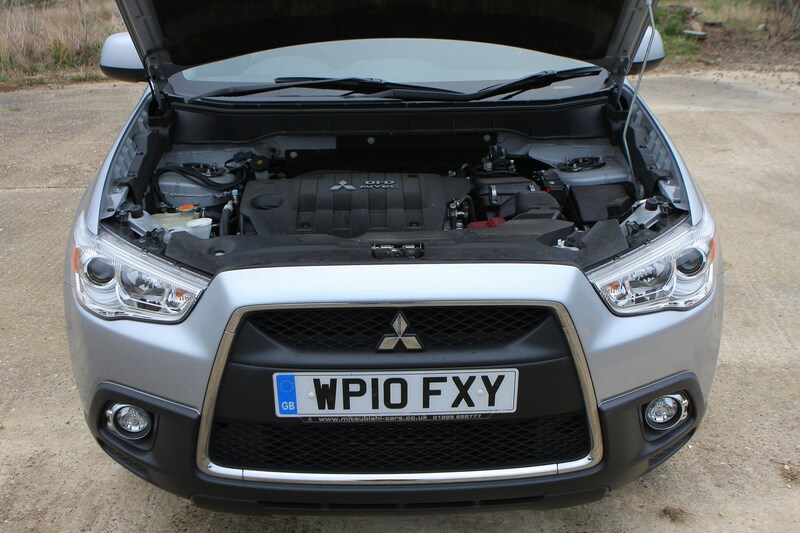 December 2013 – Crowning the range in 4 specification is a new 2.2-litre diesel engine with automatic transmission and four-wheel drive as standard. 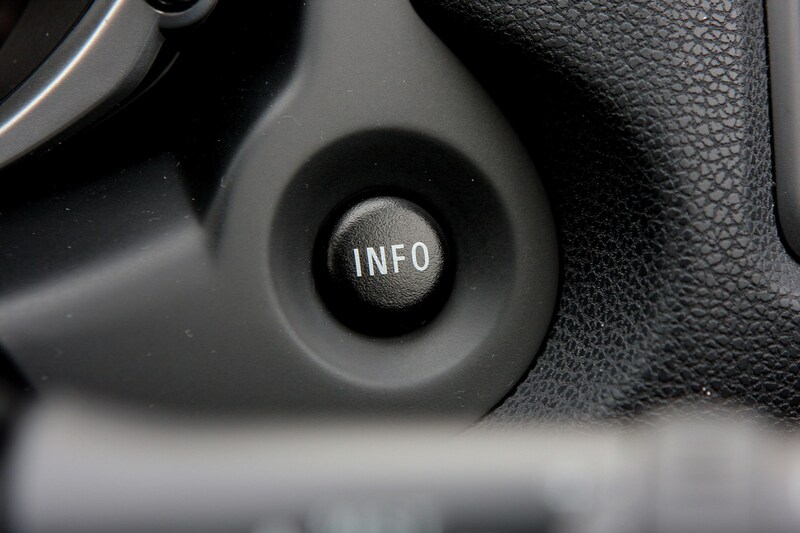 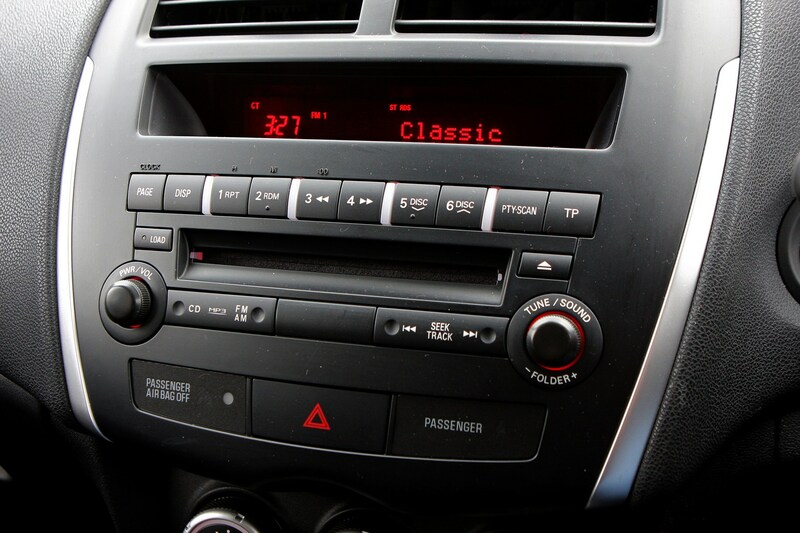 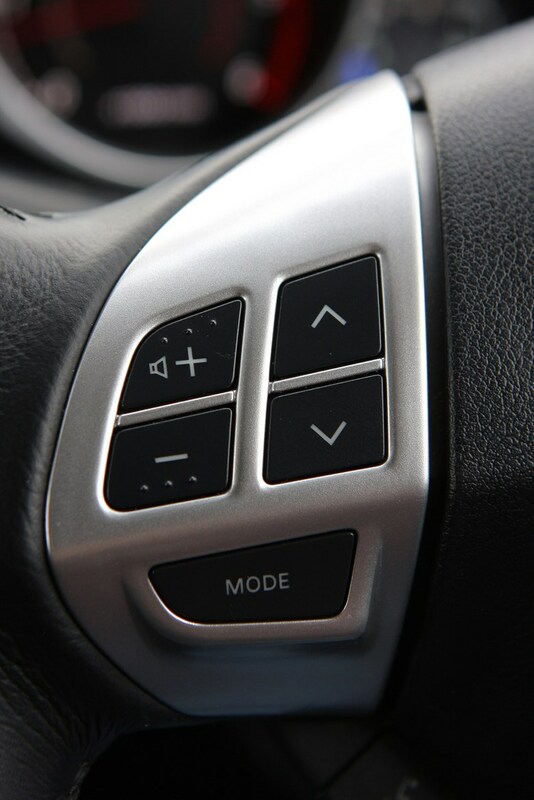 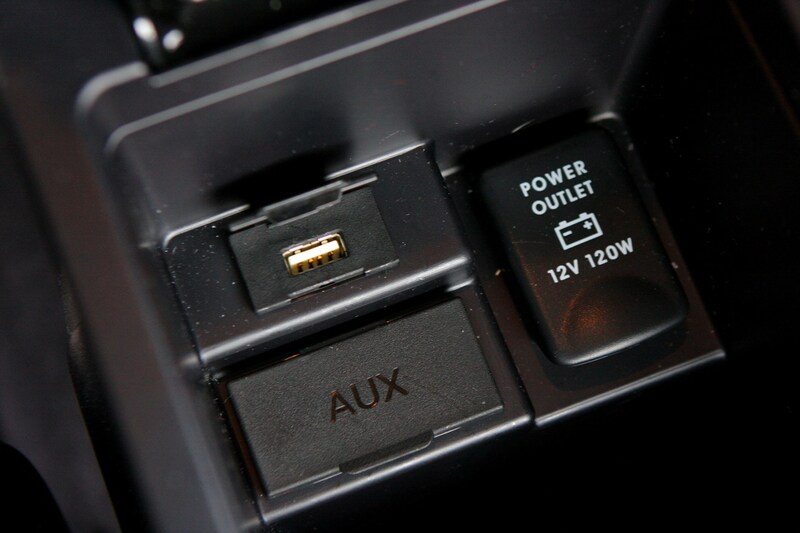 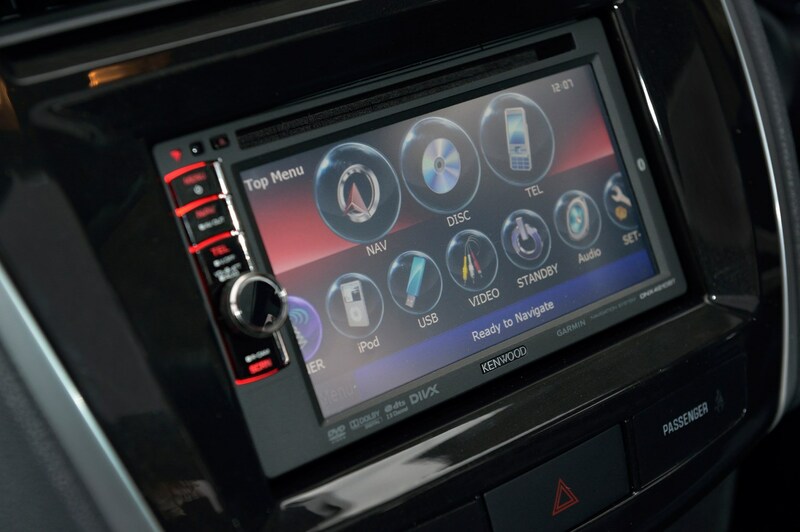 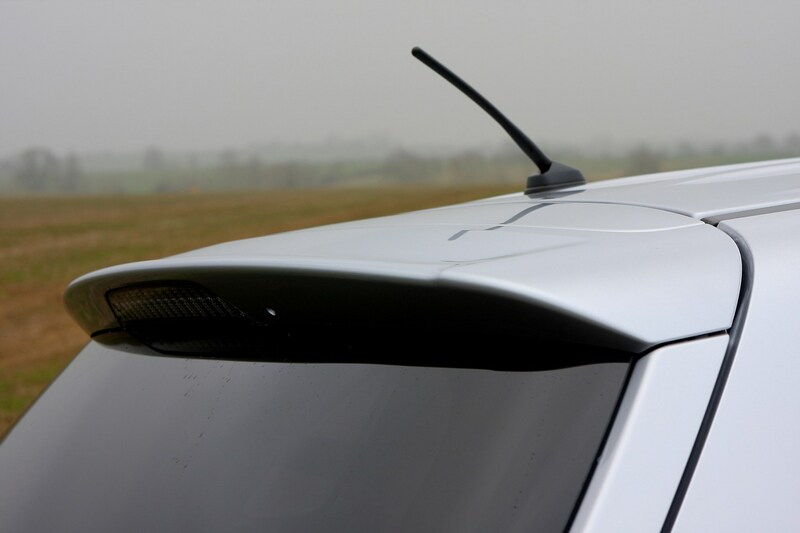 Other modifications are limited to Bluetooth connectivity being standardised on 2 grade models. 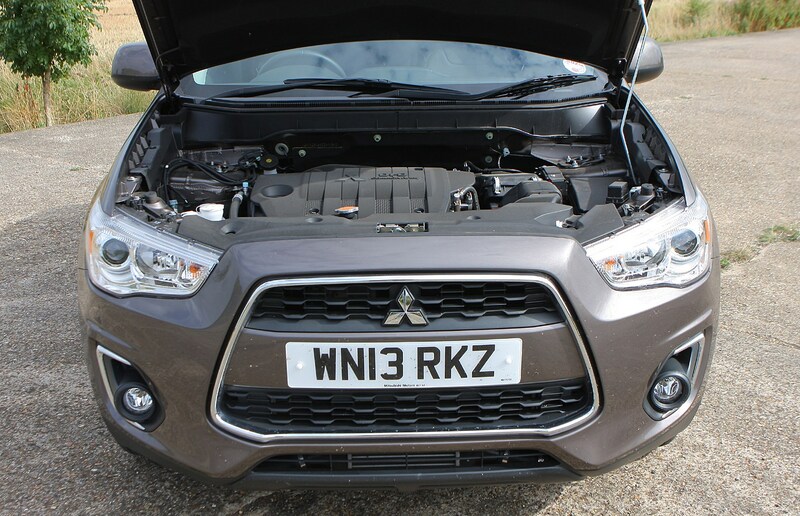 July 2015 – A series of revisions introduced include a revised front bumper and grille design, wheelarch extensions for the two highest trim levels and the availability of a new 114hp 1.6-litre DI-D diesel engine. 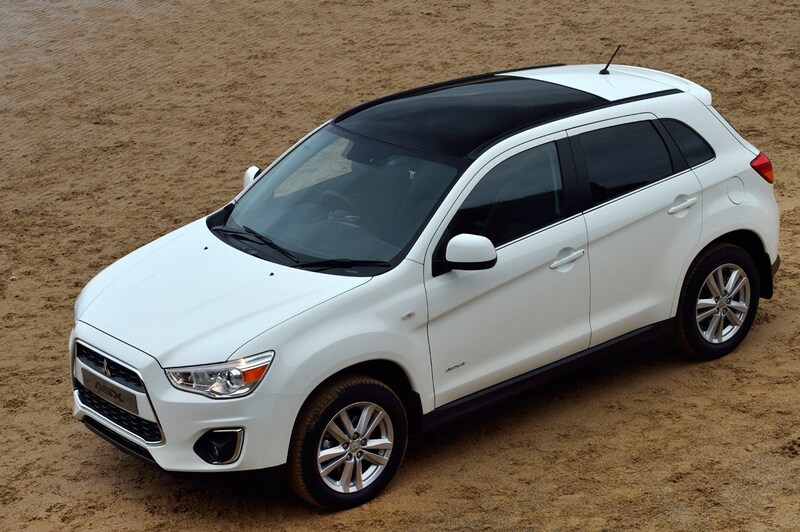 The existing trim level hierarchy gives way to a three-tier structure of ZC, ZC-M and ZC-H.
November 2016 – Mild styling refresh with another revised grille, a shark fin aerial, a new Lightning Blu paint choice and modified seat cushions. 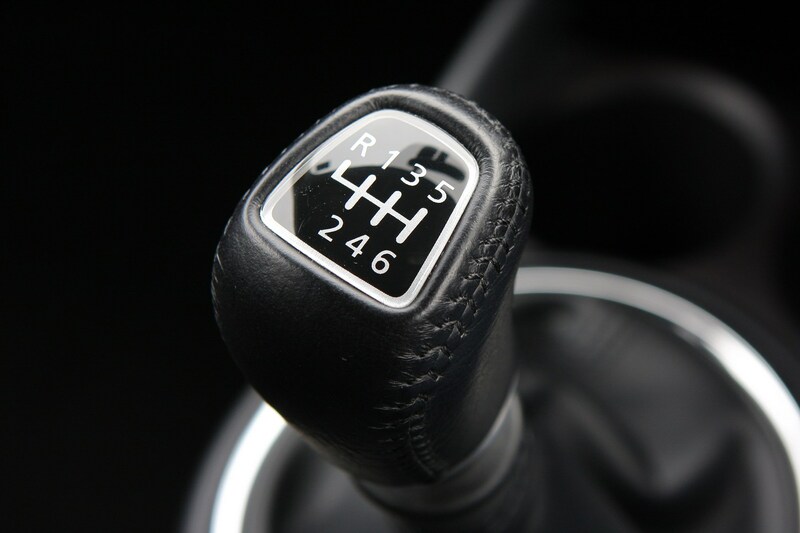 Range structure also revised with a return to the earlier 2, 3, 4 and 5 structure. 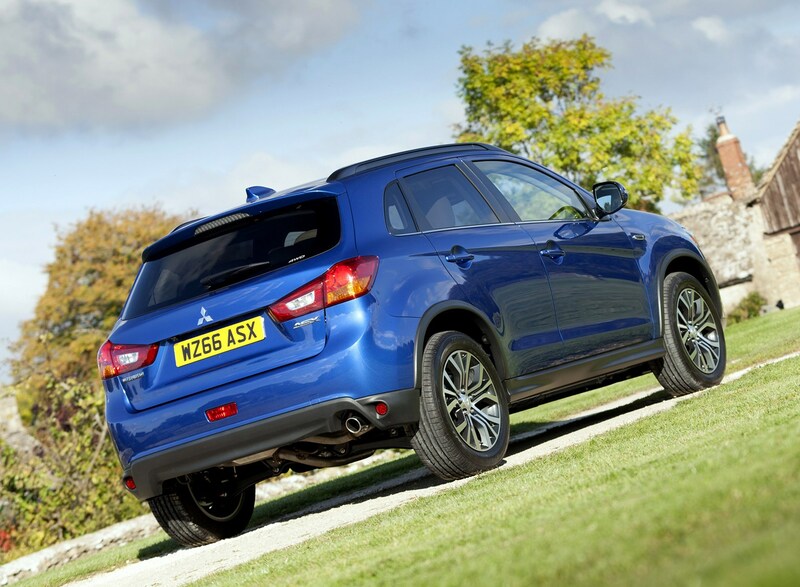 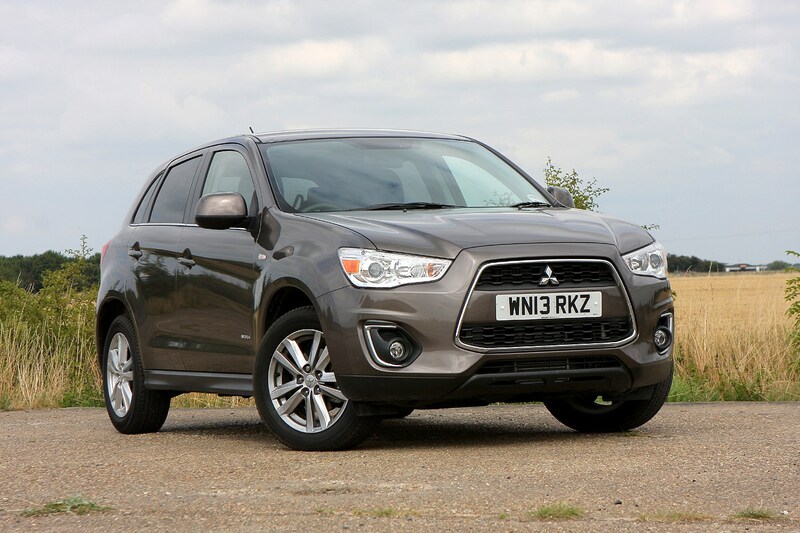 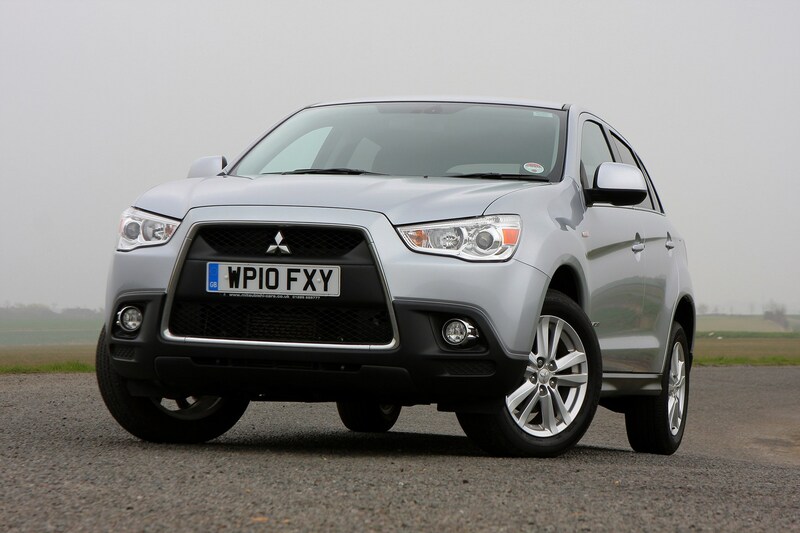 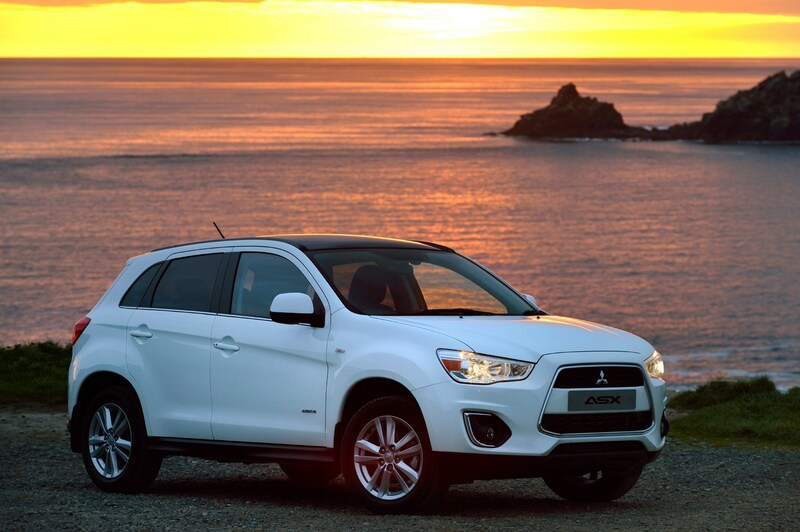 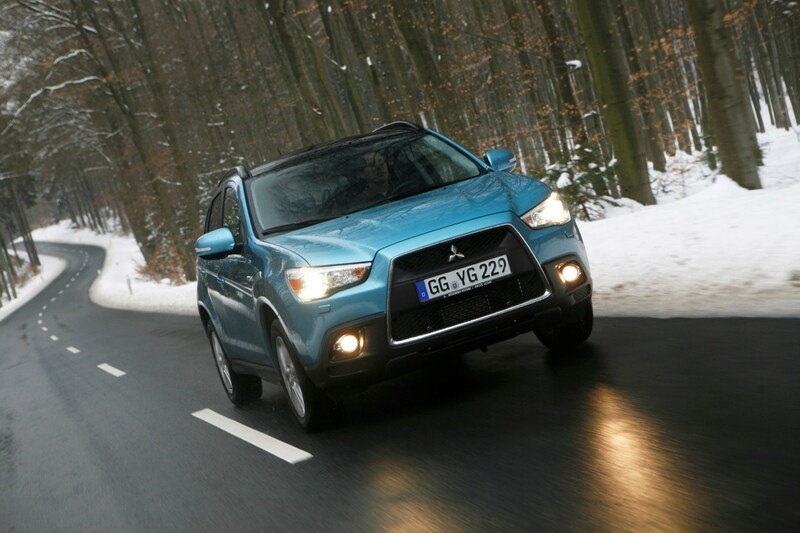 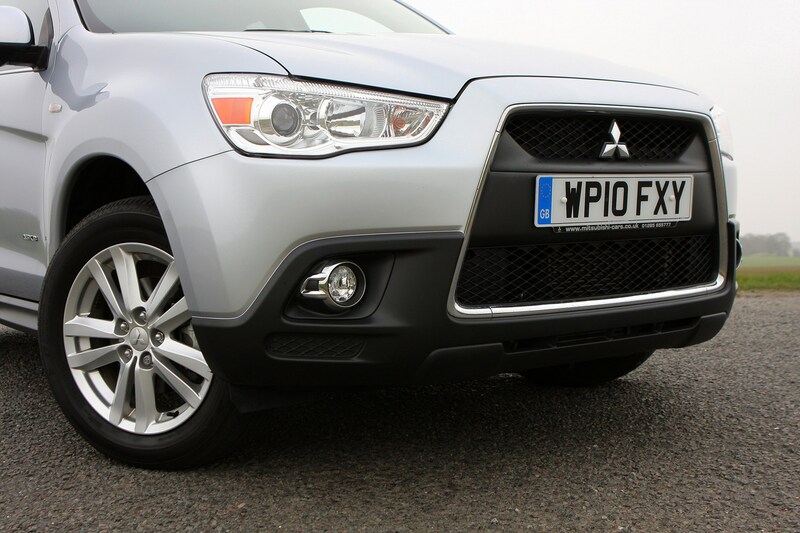 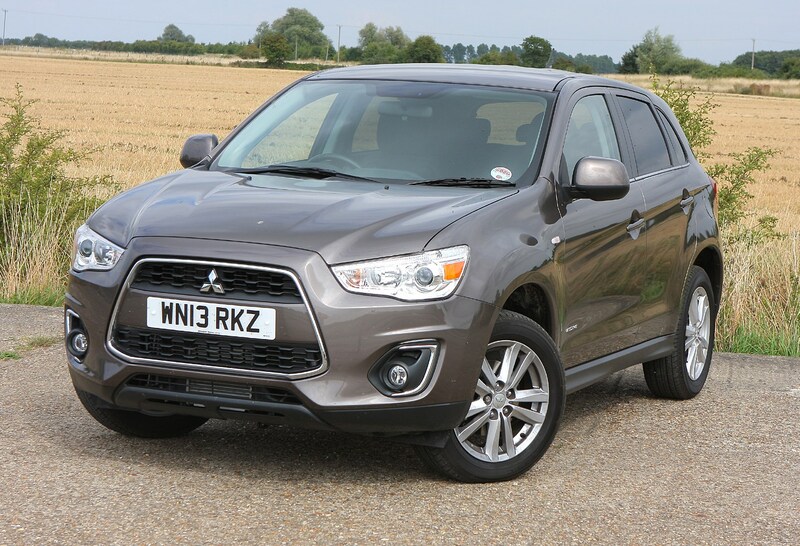 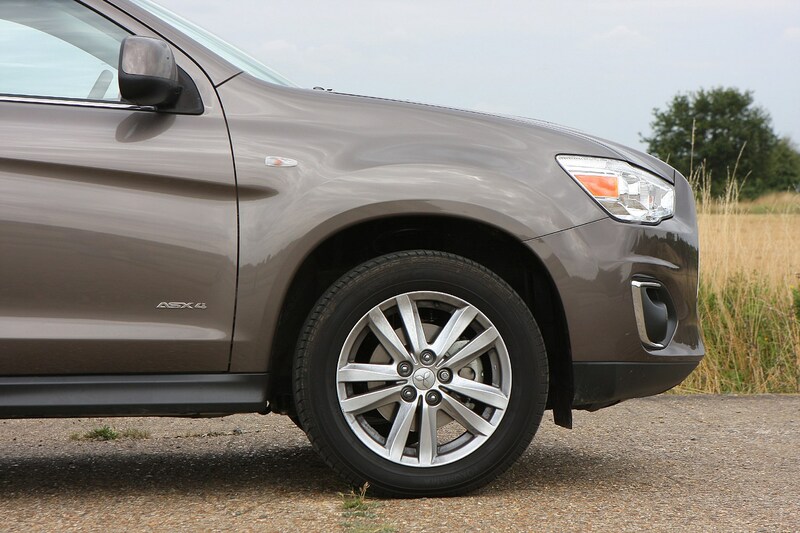 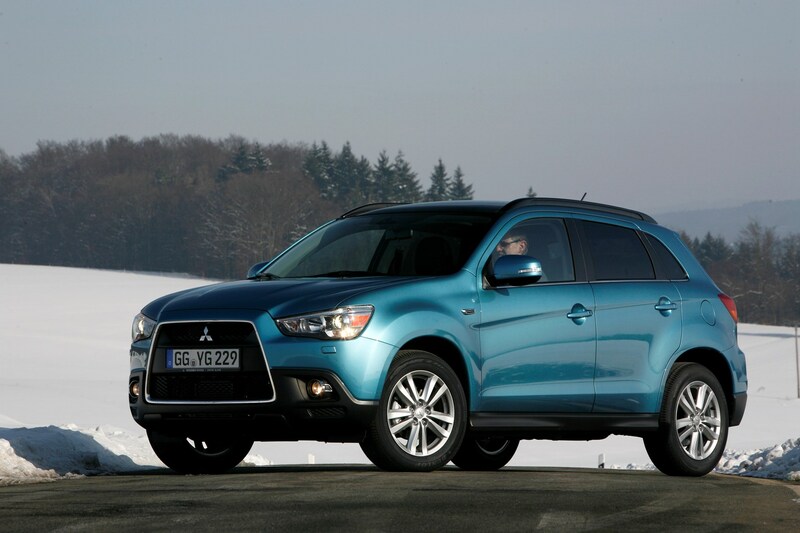 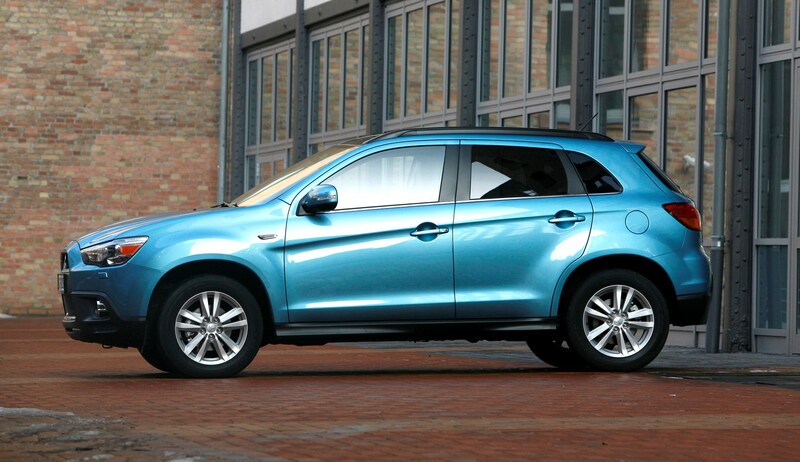 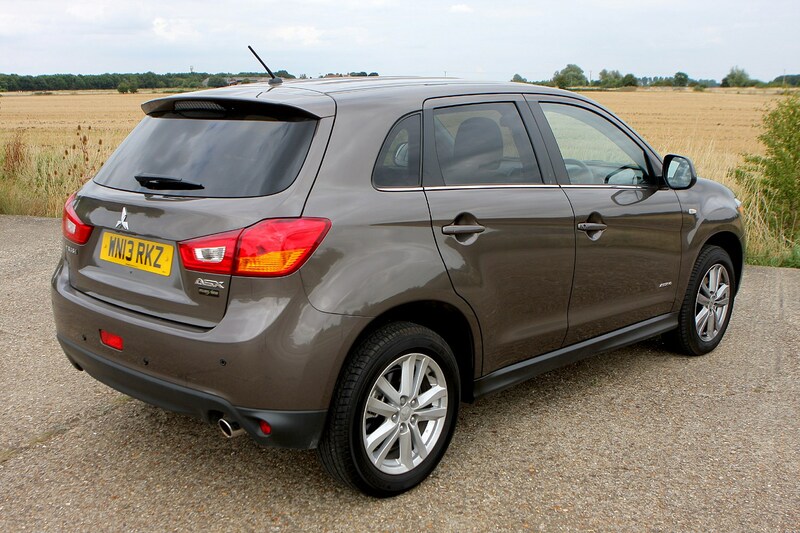 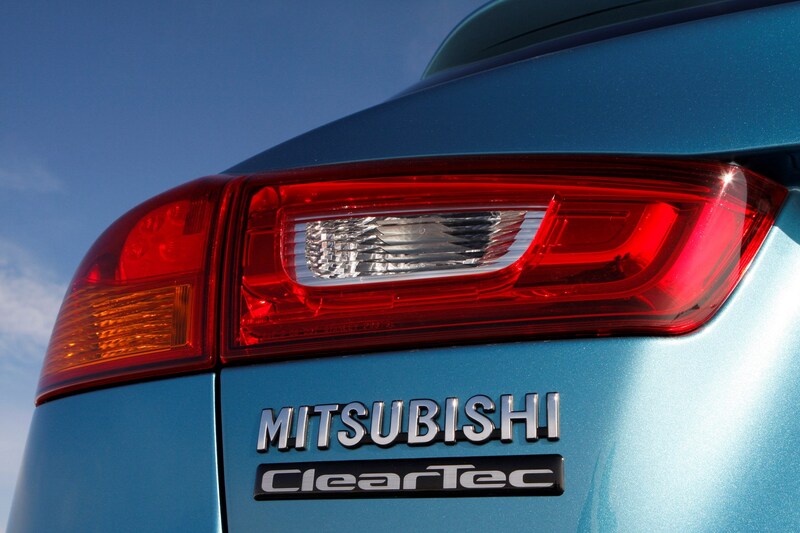 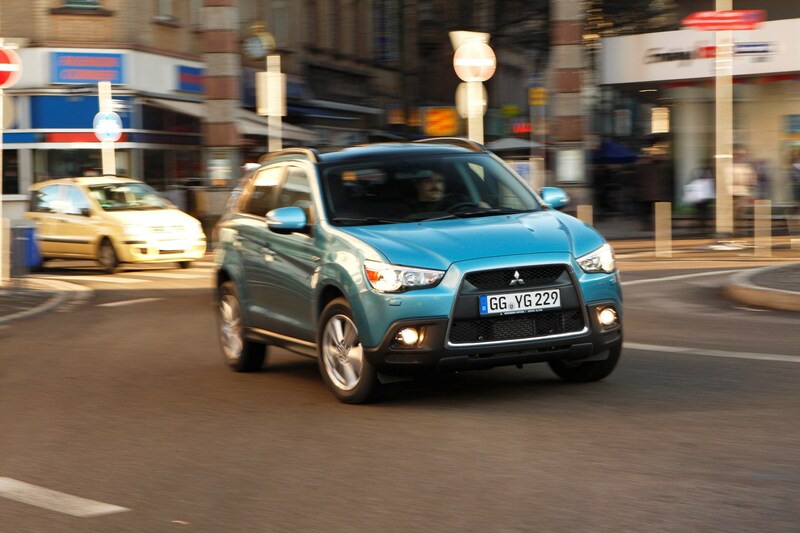 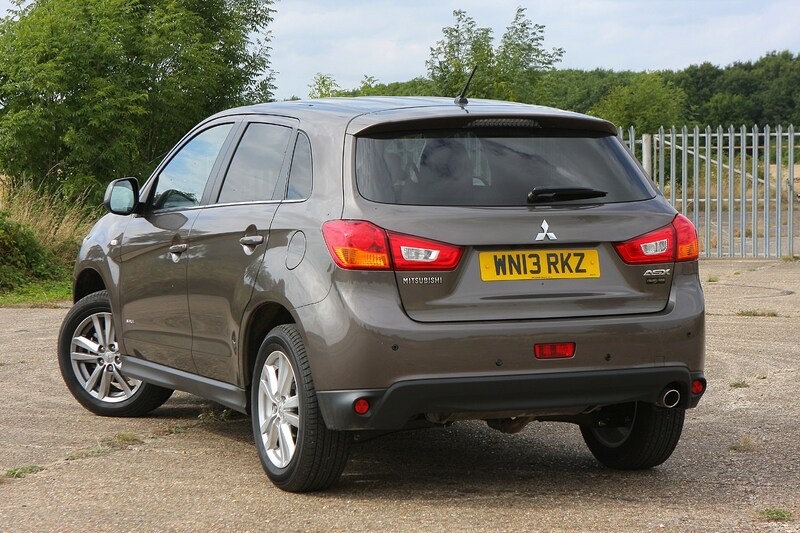 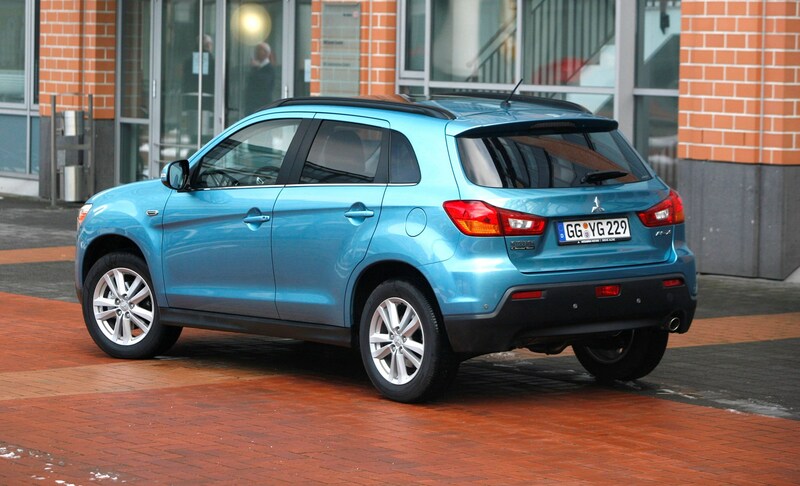 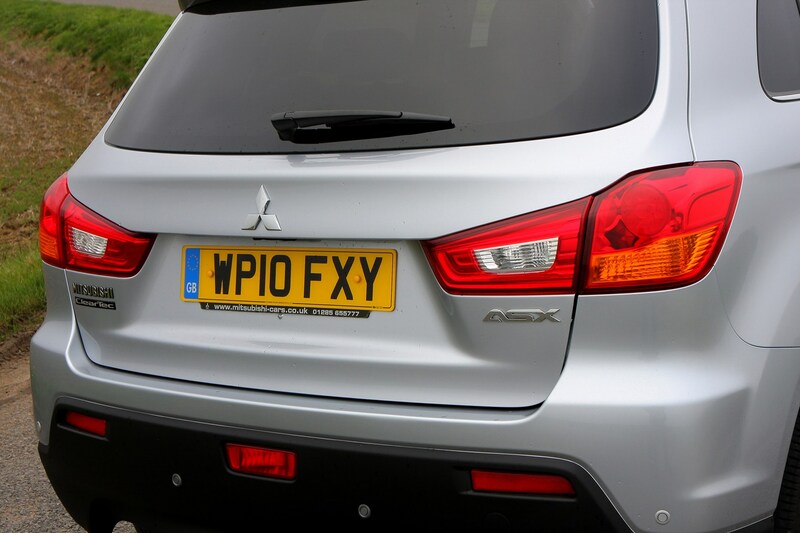 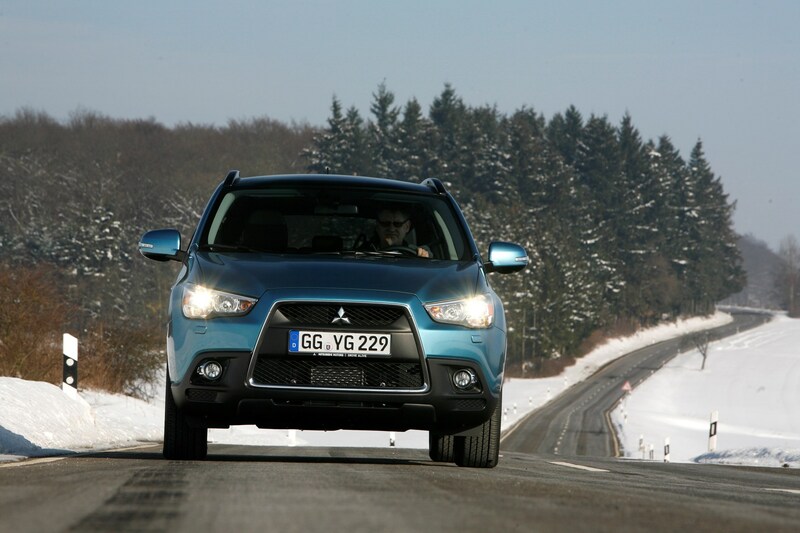 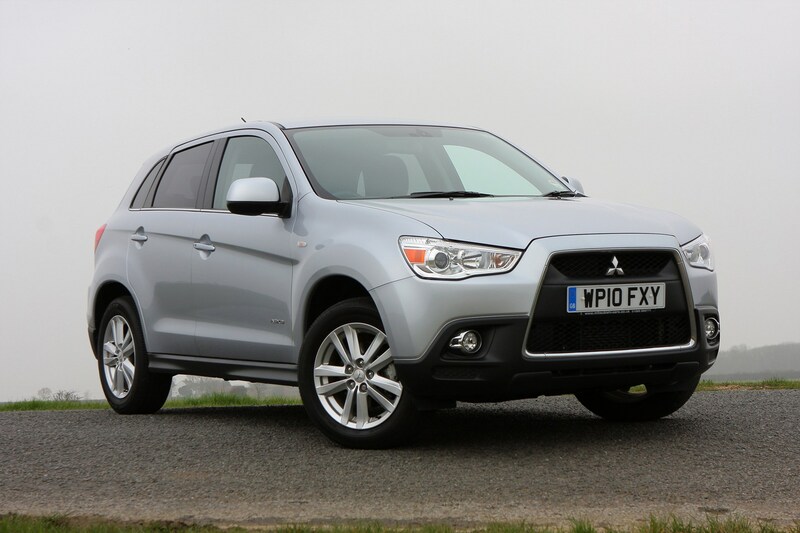 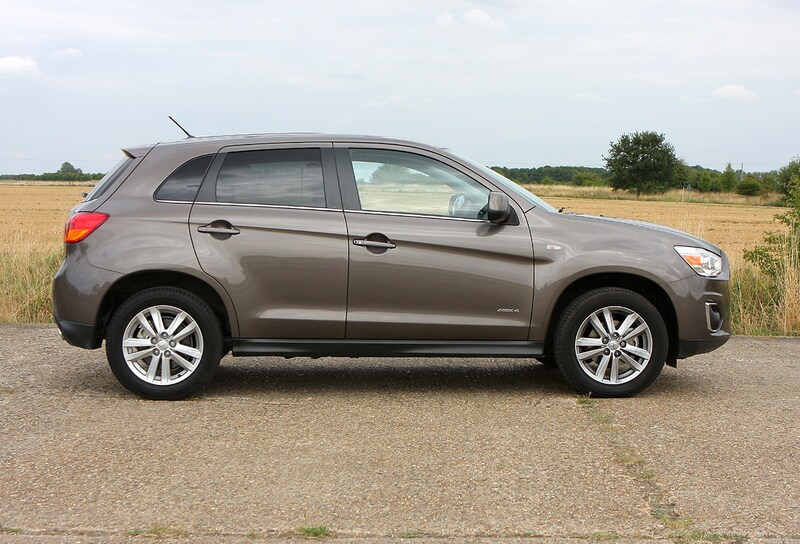 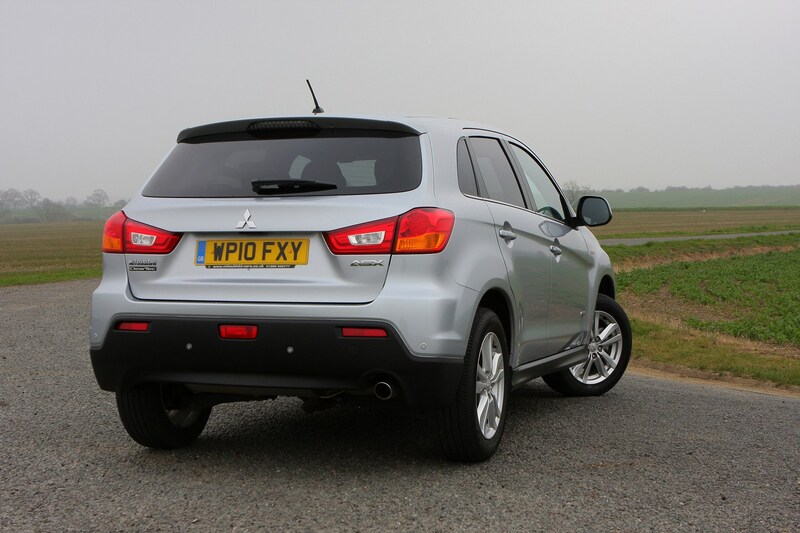 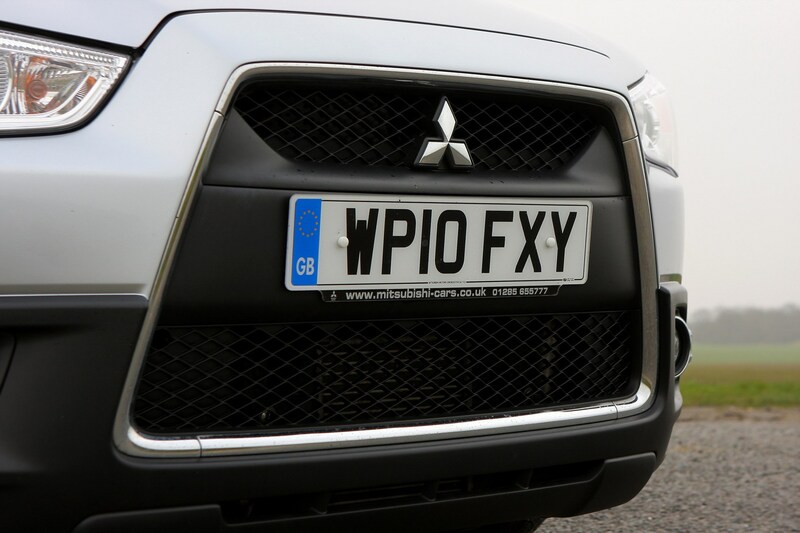 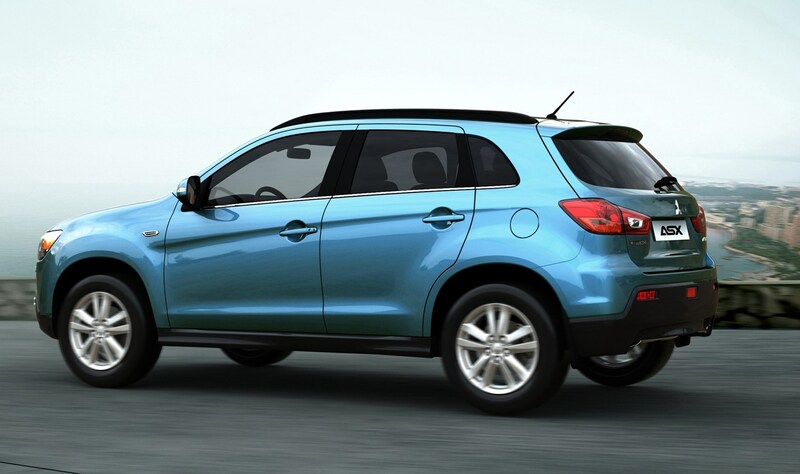 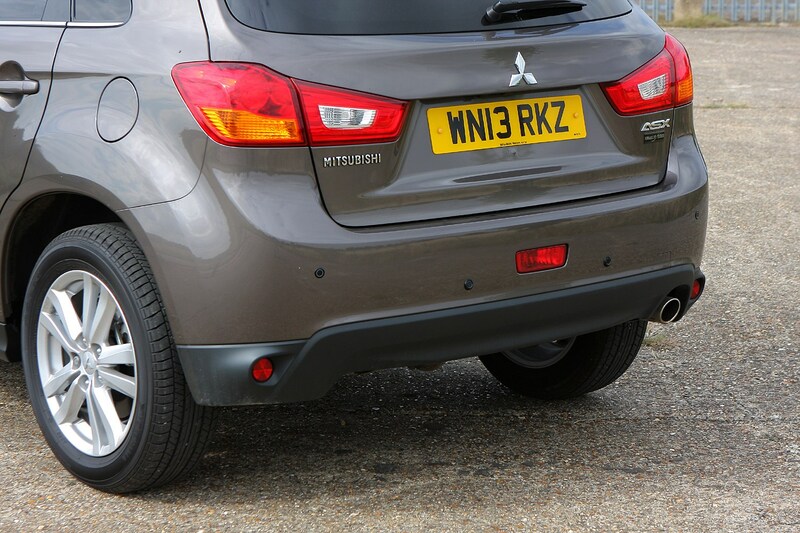 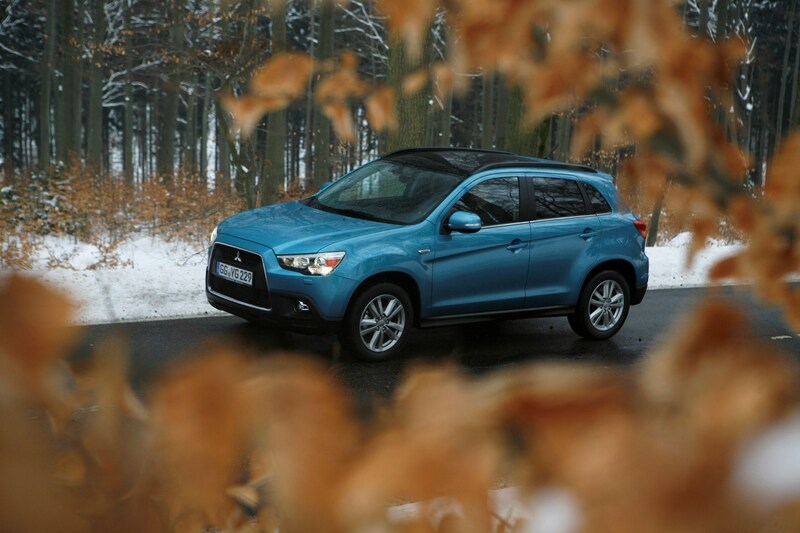 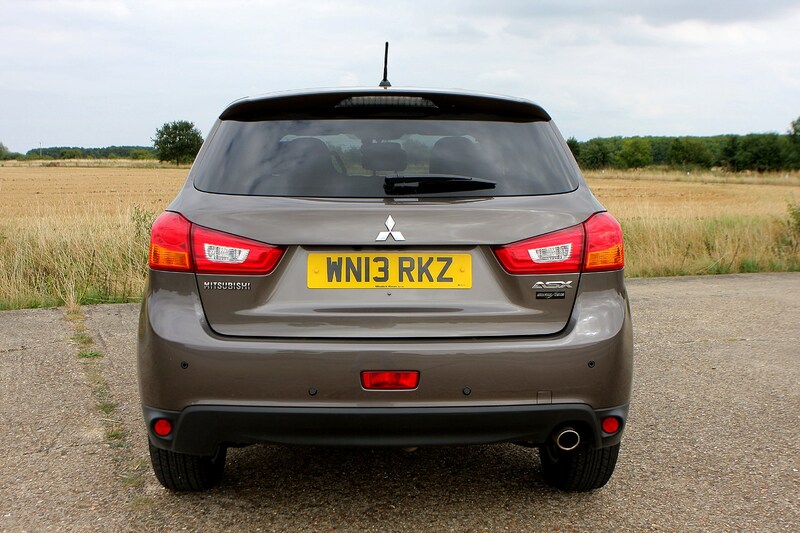 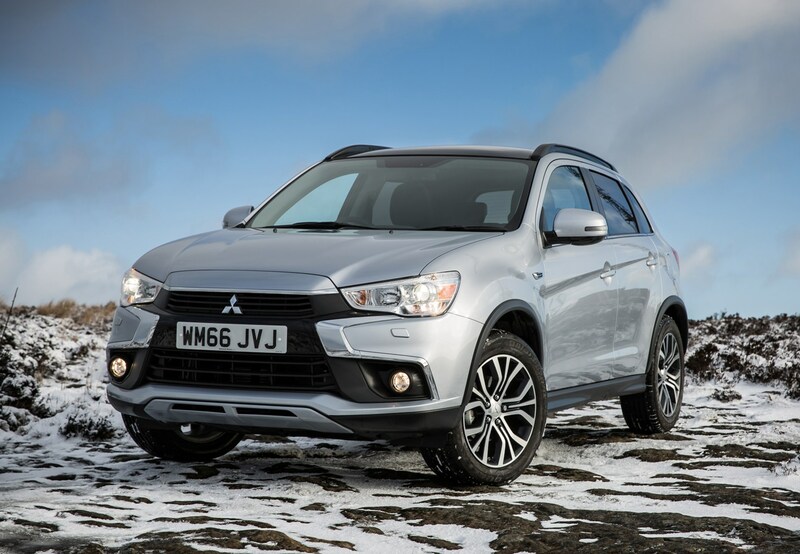 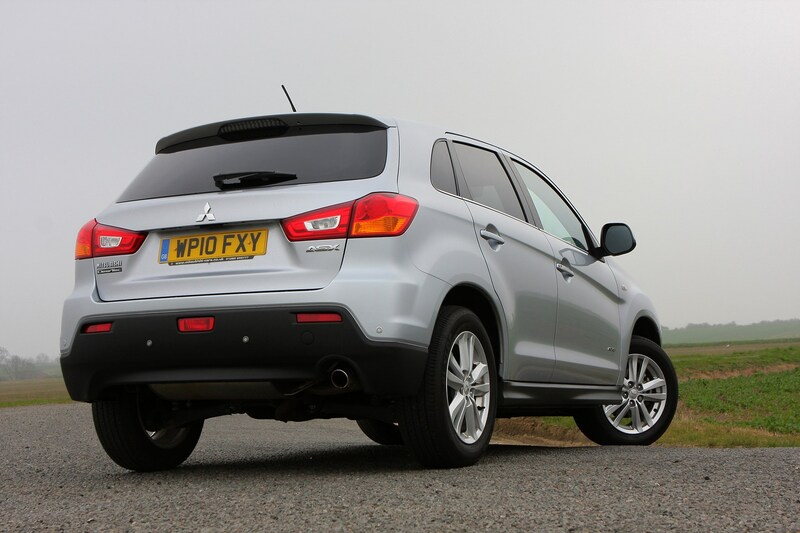 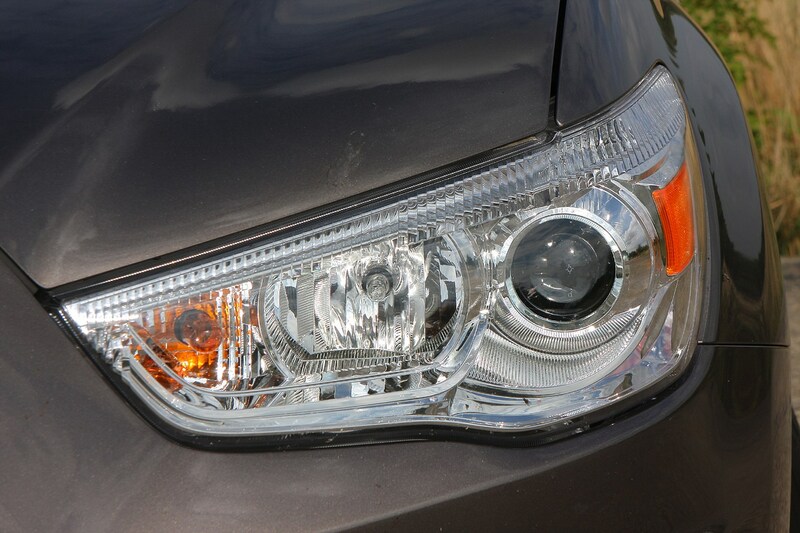 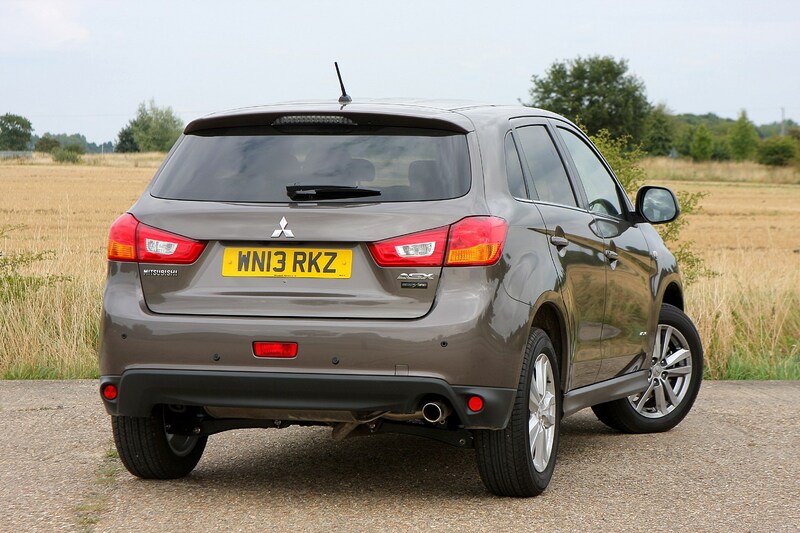 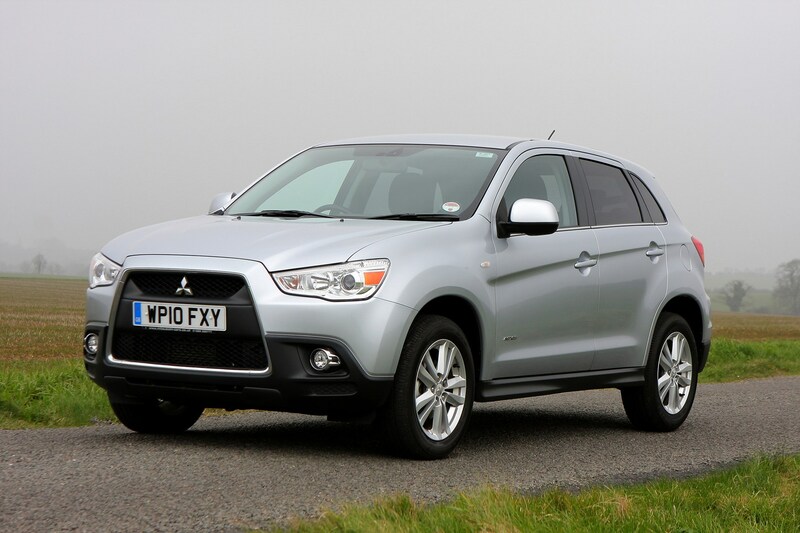 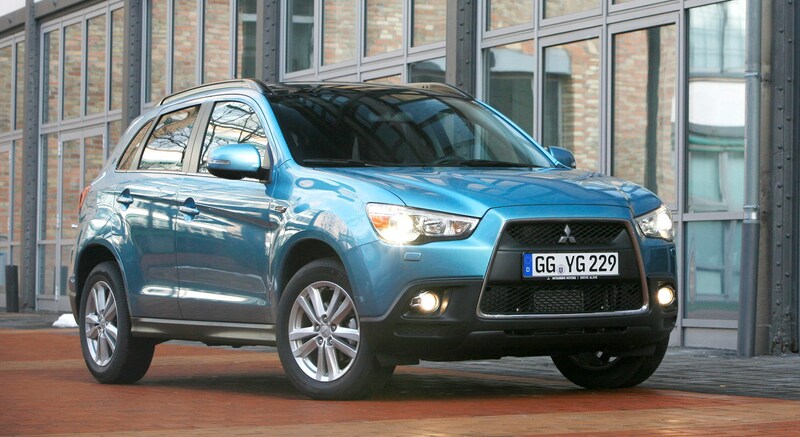 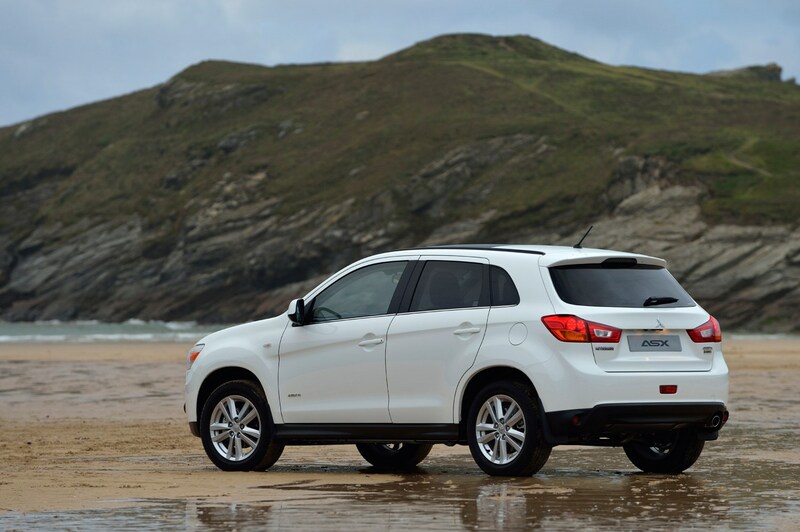 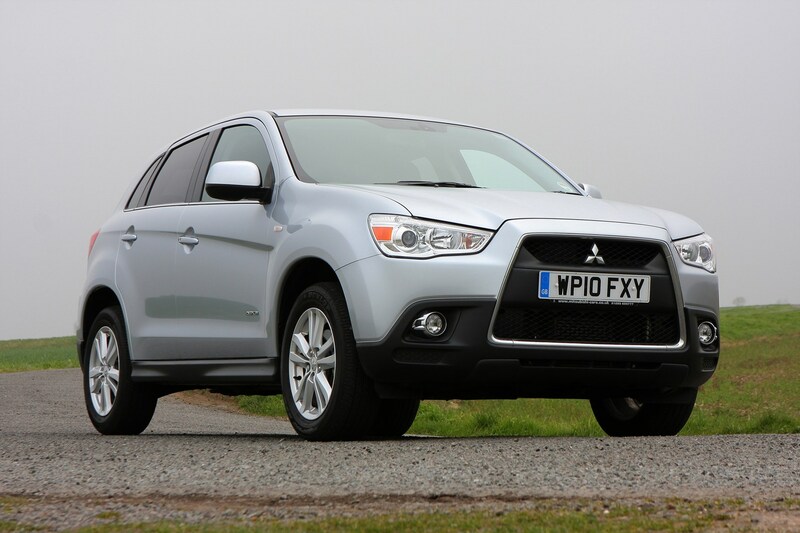 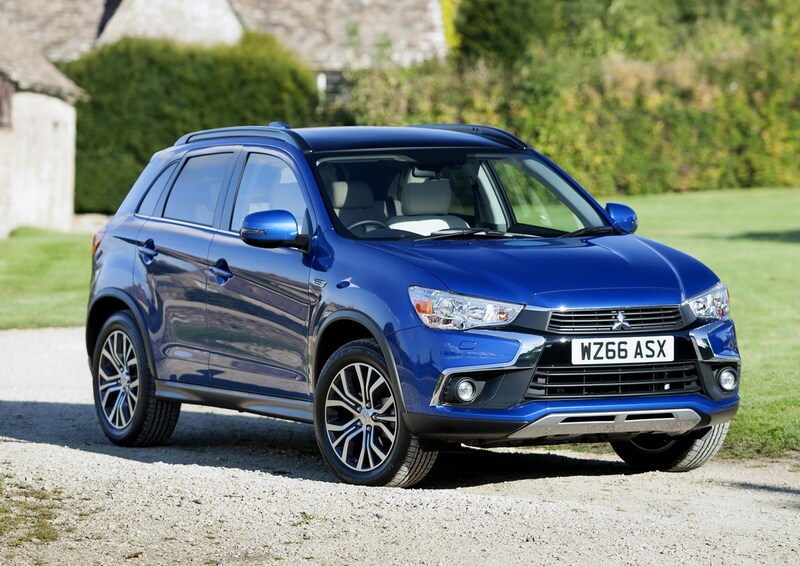 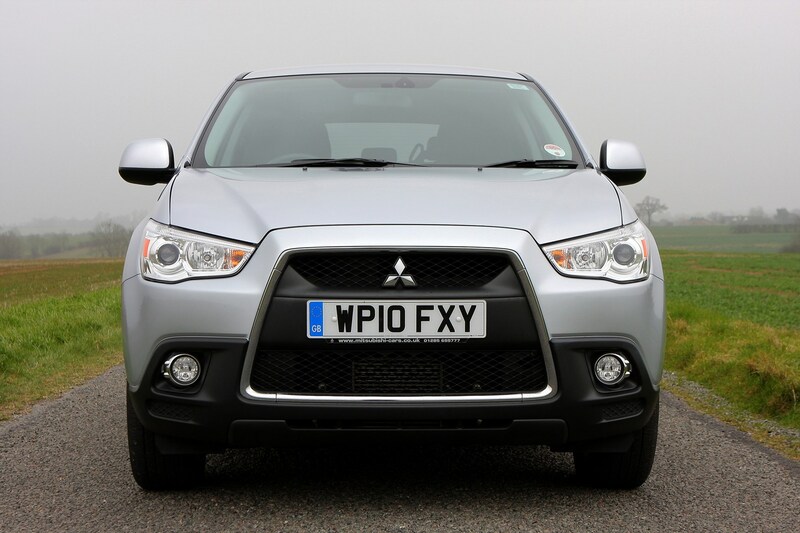 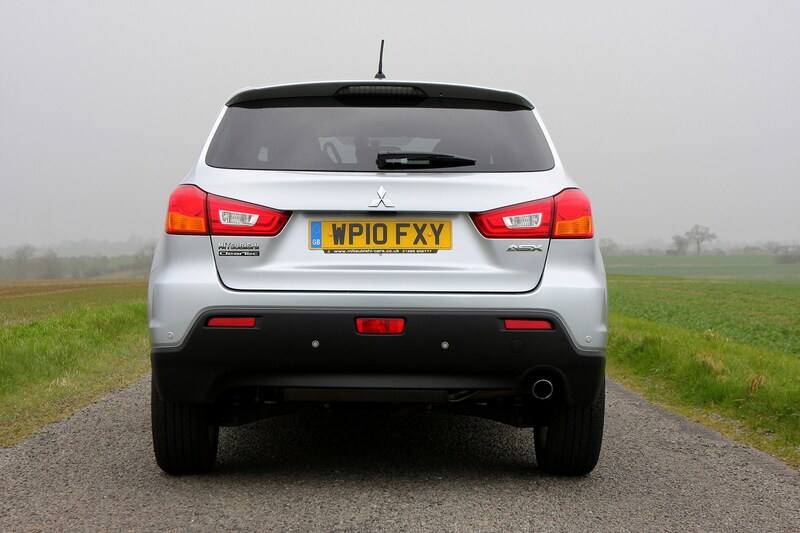 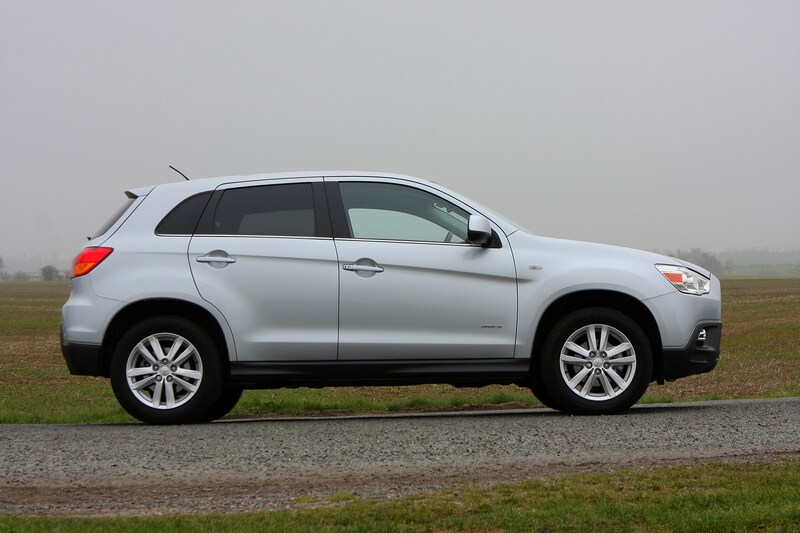 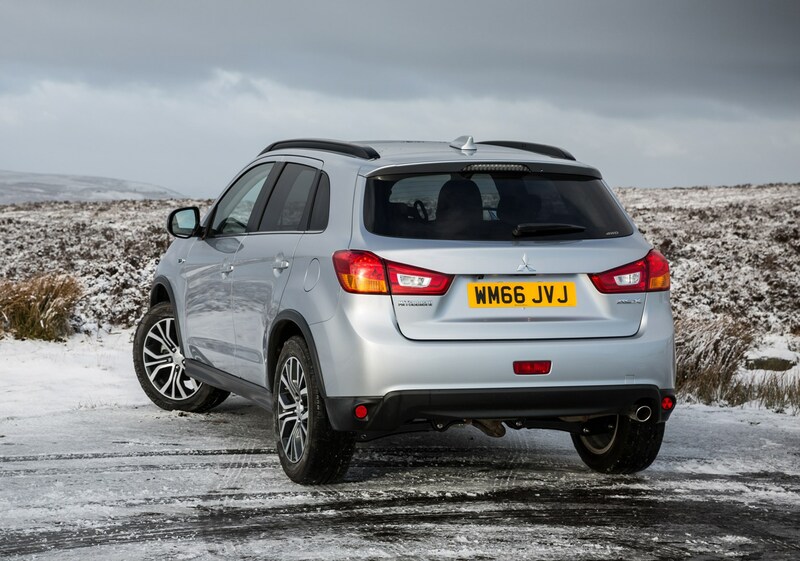 Read the full Mitsubishi ASX SUV review to find out if this is a desirable or forgettable family crossover.